My first trip north on Highway 285 through Chaffee Co., Colorado happened during our south Colorado trip in August 2002. Howard wanted to go into that area to look at some properties, and I went along for the ride. School would not start for a couple of weeks and after teaching a heavy load in summer school, I was ready for a break as well as for a change of scenery. We selected Highway 285 for our return trip home versus the interstate since Howard wanted to stop at the Rock Doc near Nathrop. He had been there before and planned to stop there again. My interest in rocks was only in the beginning stages at that time, so I mused myself with the Beanie Babies and similar items in the store while Howard inspected the rocks. We were there probably a half hour before heading back to the car and driving up the road. And we had traveled only a short distance when something captured our interest, causing us to stop once again. The traffic on 285 was light at the moment, so we pulled off the edge of the pavement and took frontal views of the school. It was then we noticed a narrow road running beside the school. 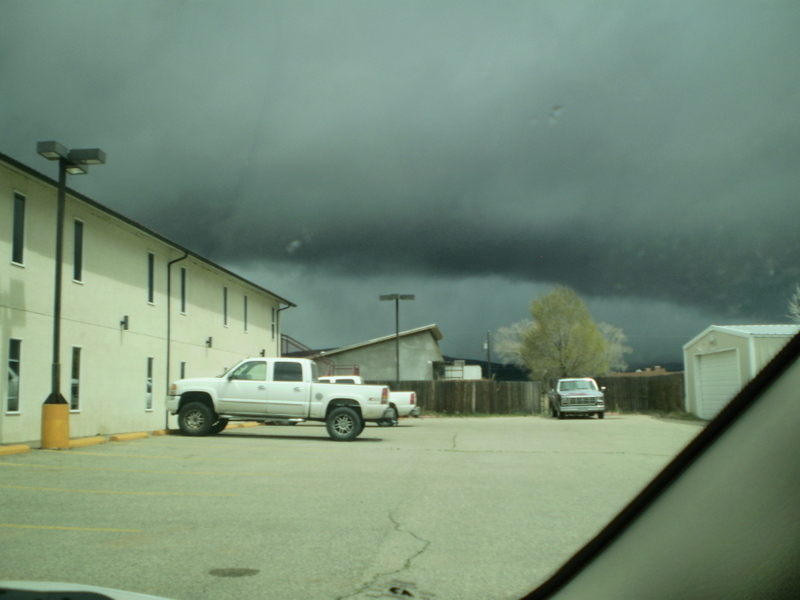 Within moments, we were inside the car and driving to a safer location to park. “1880s–maybe 1890s–” I remember suggesting as we stood there. There was an old sign above the front windows, but the weather had rendered it unreadable. I enlarged this 2007 picture in an attempt to read the date and have not been able to decide whether it reads ‘1881‘ or ‘1891’ School. We have visited this site several times since 2002 and have noticed little change. 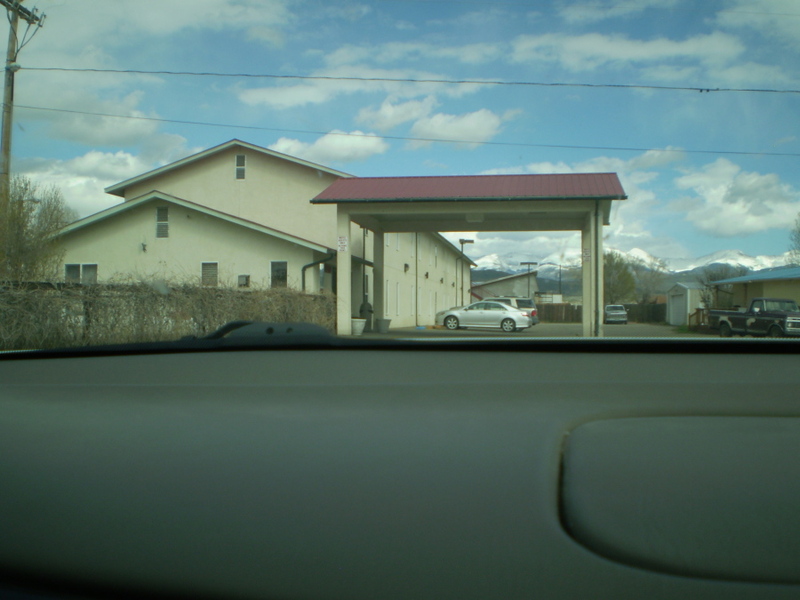 The school is undoubtedly on private property, and it is probably used for storage. 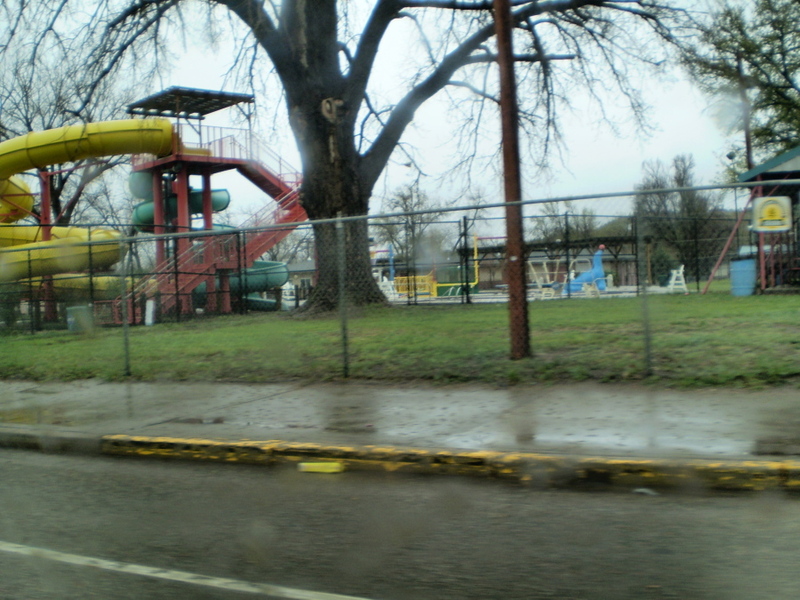 A swing set is located at the side of the property and some farm equipment items were present on the grounds for several years. 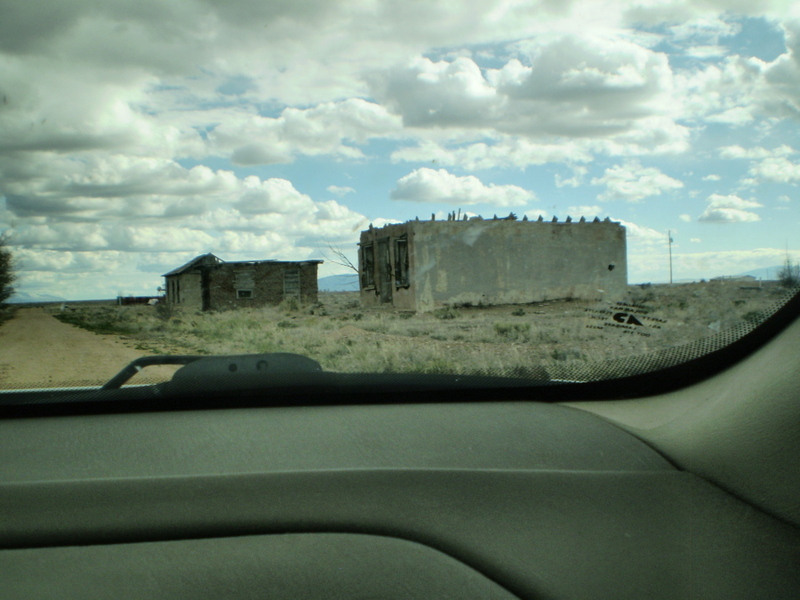 We speculated whether someone lived there, but in the end decided the building was mainly used for storage. The doors on the front of the building bear a reminder to the time when girls and boys entered and exited the building through separate doors. 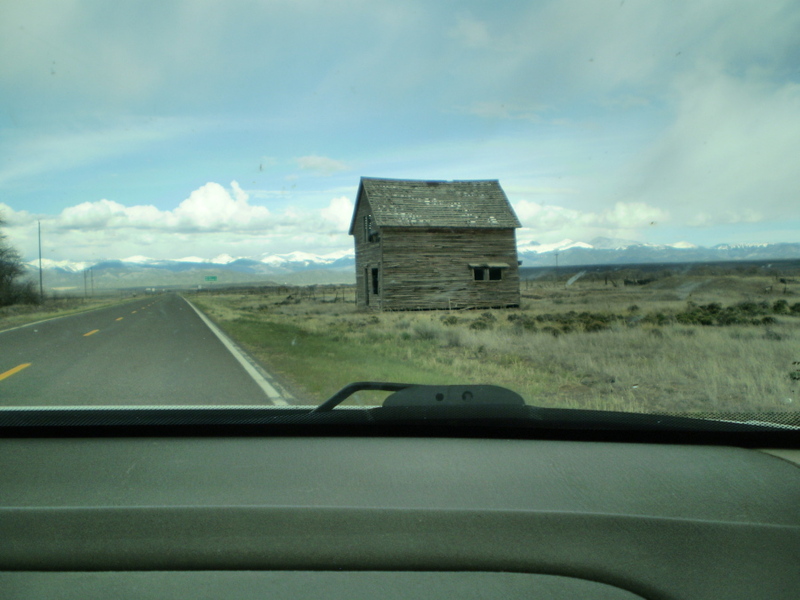 There is also an outhouse behind the school, which shows up in the frontal picture taken from the highway. 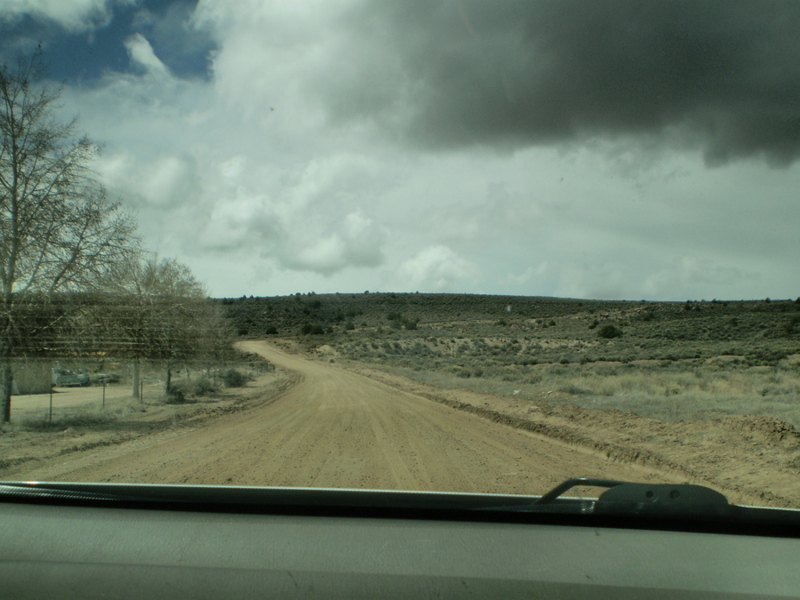 Since no one was around to answer any questions, we decided to return to the car and head up the road. That’s when something else caught my attention. In 2002, I hosted a website called Twigs of Inman & Spence. The site remained in existence from the late 1990s until 2004 or 2005 and because of the word “Twigs” in the name, I had been looking for the perfect tree to place on the site home page. The minute I saw the old cottonwood standing on the small creek near the road, I knew I had found my tree. “A hundred–maybe a hundred fifty,” he responded. 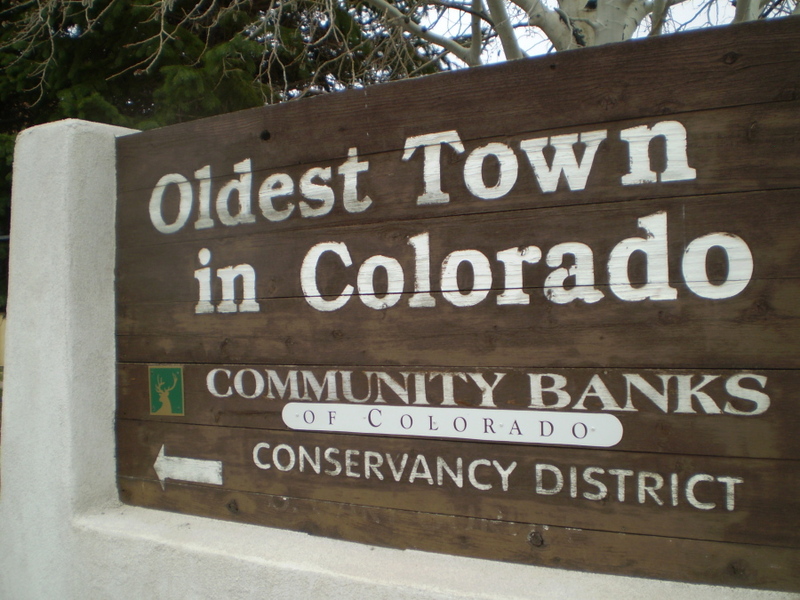 “Do cottonwoods live to be that old?” I asked. “Well, what’s going on in the middle?” I asked, noticing the efforts of some unknown creature who had been working on the trunk of the tree. We didn’t debate the issue for very long because we wanted to reach home before dark, and Howard planned to stop at Fairplay. I did use this photo on the home page of my “Twigs” site and kept it there until the site ended. Four years passed before visiting this location again. 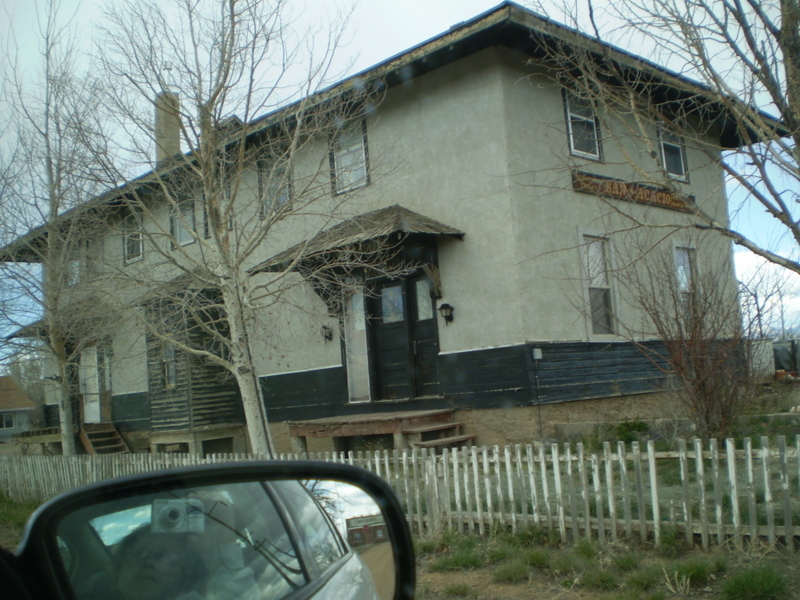 We were on another trip to south Colorado in March 2007 (spring break) and elected to return home by way of Highway 285. The tree had not leafed out as yet, so I was able to see more of its structure. I was doing a travel episode for the doll site I maintained at that period, and I wanted to photograph my dolls in front of that tree. The appearance of the tree hadn’t changed in four years. It was still intact, and I could see where some of the branches had been removed, probably because they were hanging over the road. Some areas of the tree suggested the location of a large treehouse at one time. I could see evidence of that on the sagging side. No doubt, that structure weakened the tree, causing one side to sag. 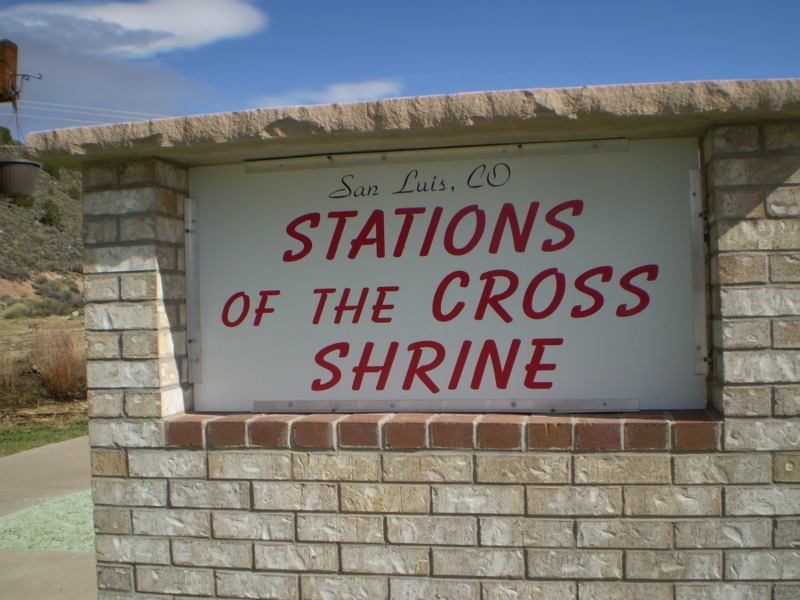 We stopped at the site again in May 2007. Very little change had taken place. Two additional years passed before visiting that location again. I thought about the old tree, however, and remembered the question I asked in 2002: “Is it possible for a cottonwood to live one hundred fifty years?” This was something I decided to find out! As a child growing up in Cedar Rapids, Iowa, I lived next door to a cottonwood tree. It sat right beside the house and provided us with shade in the summer. Summers were horribly hot and humid, and the tree served an excellent purpose. It was a tall tree and was probably planted about the time the house was built in the 1890s. And that tree never missed a beat! Spring would bring the abundance of “wormlike seeds” that covered our yard and stuck to our feet. Fall provided tons of leaves that required raking and burning. And summer would bring the hoot owl who would sit in the branches and hoot while spying out a meal for the night. My mother said the only reason the tree remained was because of the shade. She would have preferred a maple, which would take too long to grow. I didn’t mind the cottonwood at all and acquired quite an imagination about it. We bought our first television set in 1954 and it wasn’t long before my sister and I discovered the quantity of old western films available–something we could not get enough of! The stories always followed the same format: good guys wore white hats; bad guys wore black hats; good always won over evil; and bad guys were often lynched from cottonwood trees. I remember playing on the swing set in our backyard, speculating whether a bad guy ever swung from the branches of our old cottonwood. And later on, this type of speculation fuelded my interest in the old tree south of Nathrop. I wondered about the exact age of the tree, and I also wondered about the history of the area surrounding Nathrop. Curiosity sent me on a search for information. 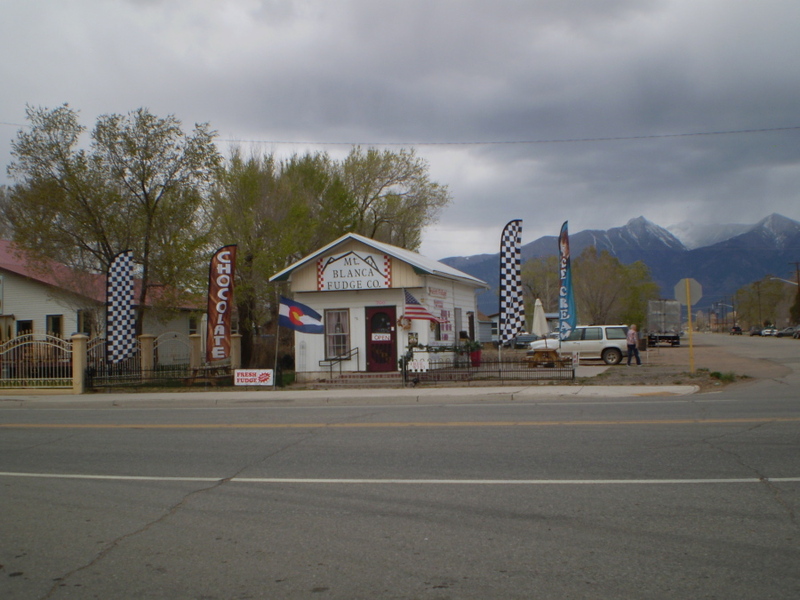 Nathrop is an unincorporated town located at the intersection of State Highway 285 and Chalk Creek in central Chaffee County. 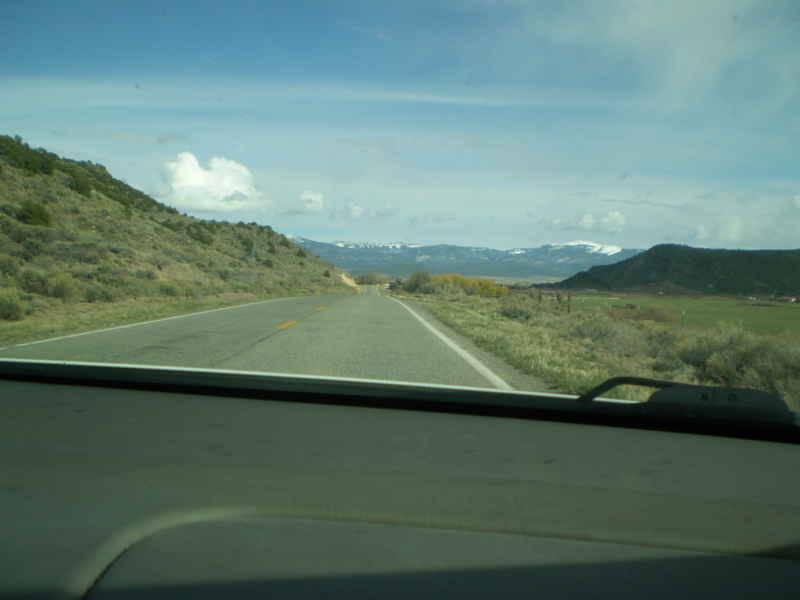 Points west of Nathrop on Chaffee County Road 162 include the Mt. Princeton Riding Stables, the Mt. 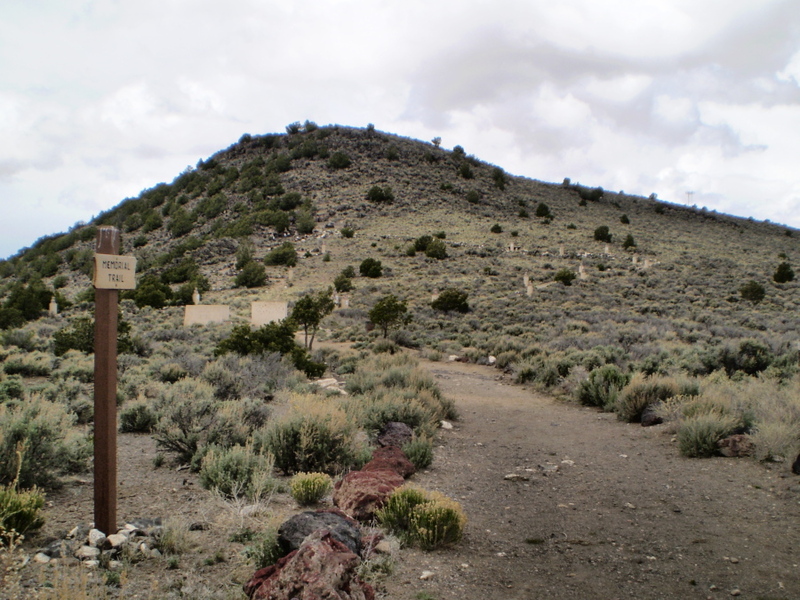 Princeton Hot Springs, Agnes Vaille Falls, the trail to Mt. 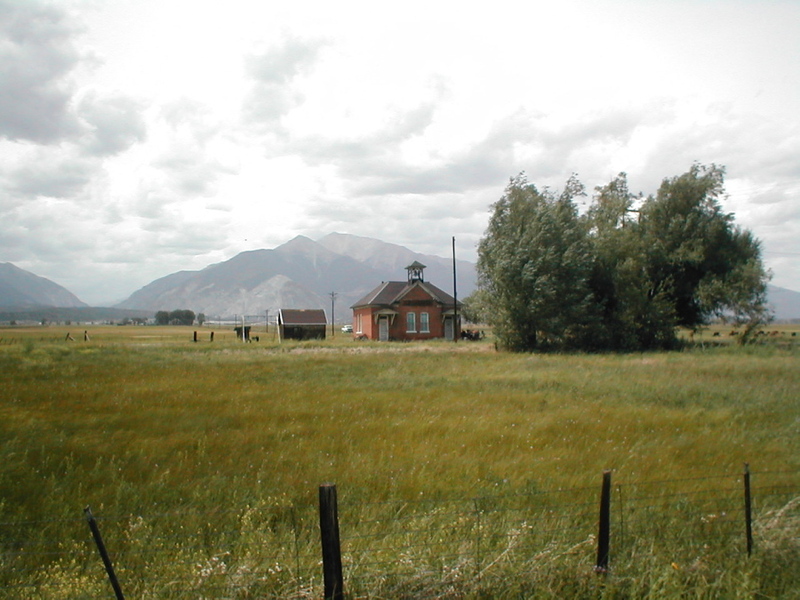 Antero, Tincup Pass and the “ghost towns” of St. Elmo, Romley and Hancock. 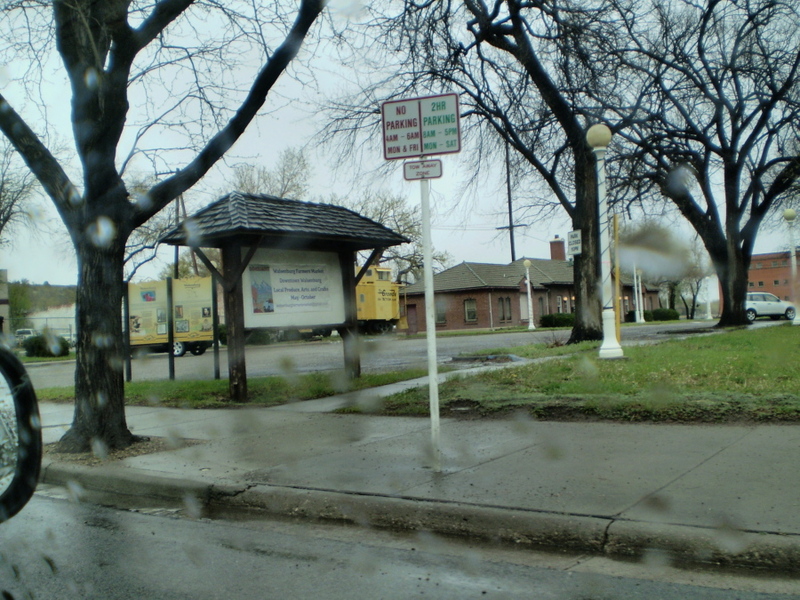 Founded approximately in 1880, Nathrop served as a transportation terminal for two railroads: the Denver South Park & Pacific and the Denver & Rio Grande. 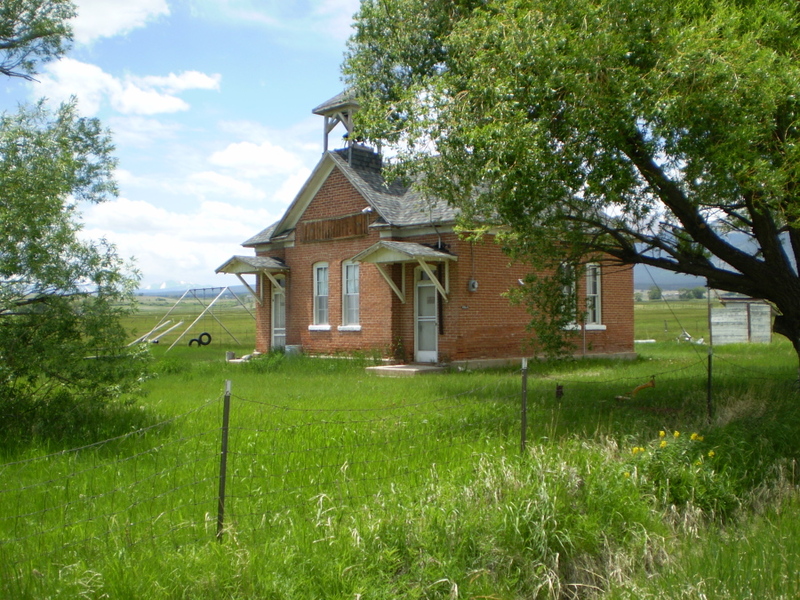 The historic and well-preserved Nathrop schoolhouse was built in 1881. In its heyday, Nathrop had a stone depot, a large hotel and two saloons (1). 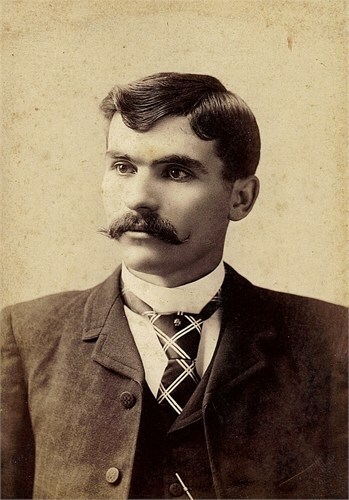 Charles Nachtrieb I, was the founder of the town of Nathrop, Colorado. Early settlers could not pronounce the German name of Nachtrieb easily, so the name of the hamlet was Americanized to Nathrop. 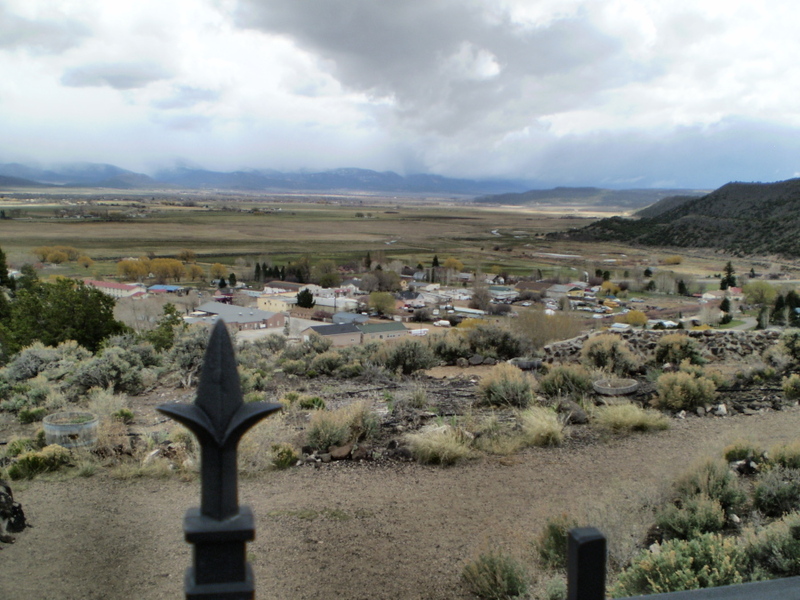 The original site of Nathrop was about one and one half miles north of the present townsite and served as a stagecoach station between Bale’s station near Cleora and Leadville. Nathrop was moved about 1880 to surround the South Park Railroad’s stone depot. At that time, the village boasted of a population of about 200, Nachtrieb’s elegant hotel as well as others, several saloons, stores, and a weekly newspaper, “The Press”. Nachtrieb was born in Germany in 1833. His parents and family members immigrated to Baltimore, MD when Charles was young. By the age of 29, in 1859, Nachtrieb was in Denver CO with a load of goods to sell. 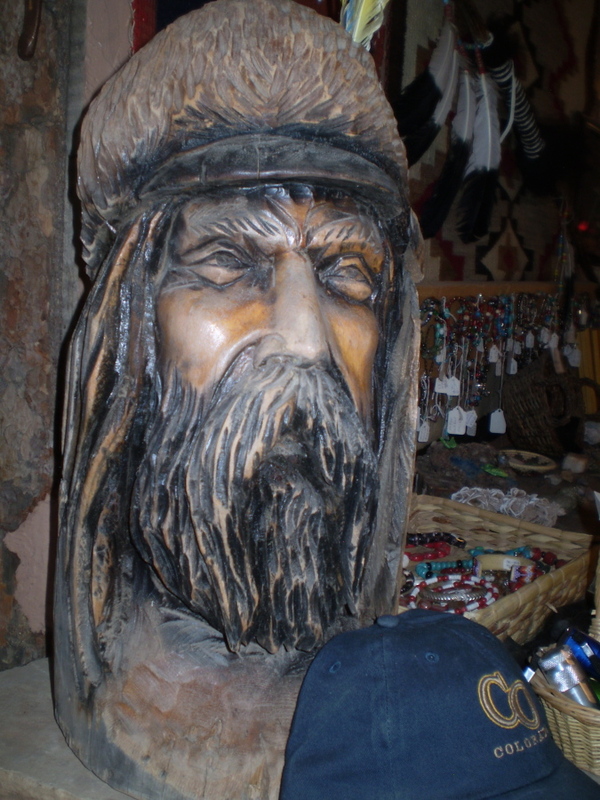 A year later found him in California Gulch near the present town of Leadville, CO engaged in merchandizing. Charles Nachtrieb owned his Chalk Creek ranch by 1865, and in 1868, he built the first area grist mill to grind flour and grains for the locals. Later, he built a saw mill near the mill. 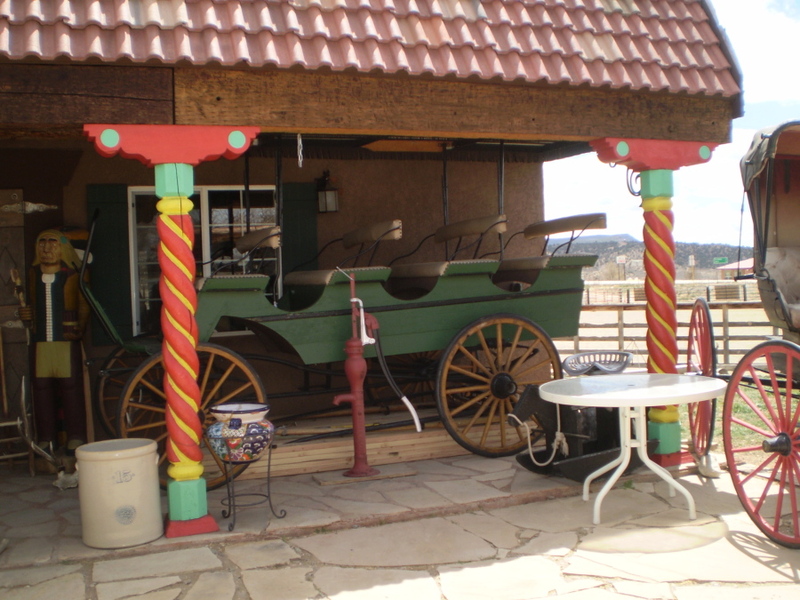 He eventually built up his land holdings to over 1000 acres, a barn, outbuildings, blacksmith shop, storehouse, warehouse and a 8-room dwelling that still stands in 1996. 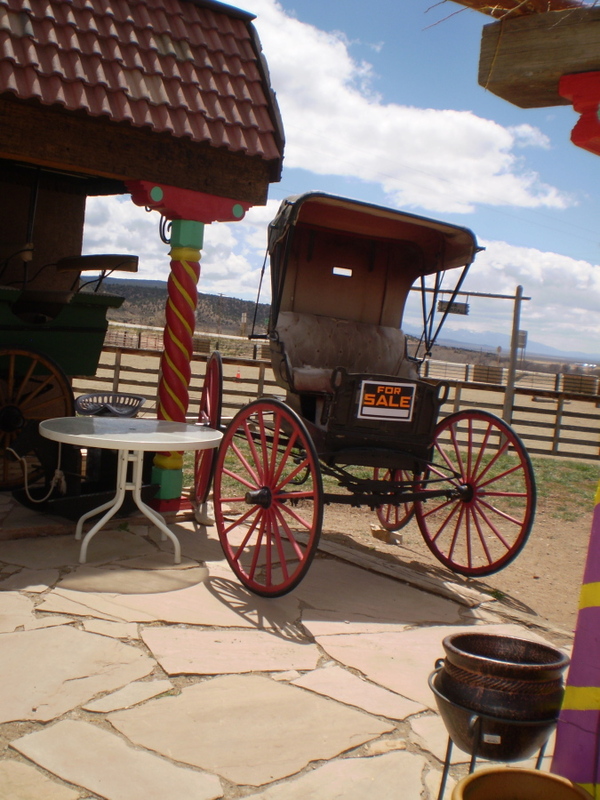 In 1870, he built a toll road over Poncha Pass, which he later sold to Colorado Pathfinder Otto Mears. In 1871, he married Margaret Tull Anderson. She had five children by her first marriage: Horace G, age 13, Louis, age 11, Alice, age 7, Belle and Fred Anderson. Charles and Margaret had five children of their own: a infant son and daughter who died by 1879; Charles II, Chris, and “Doc” Josephine. In 1874, the grist mill was used as a headquarters for the vigilante committee during the Lake County Wars. 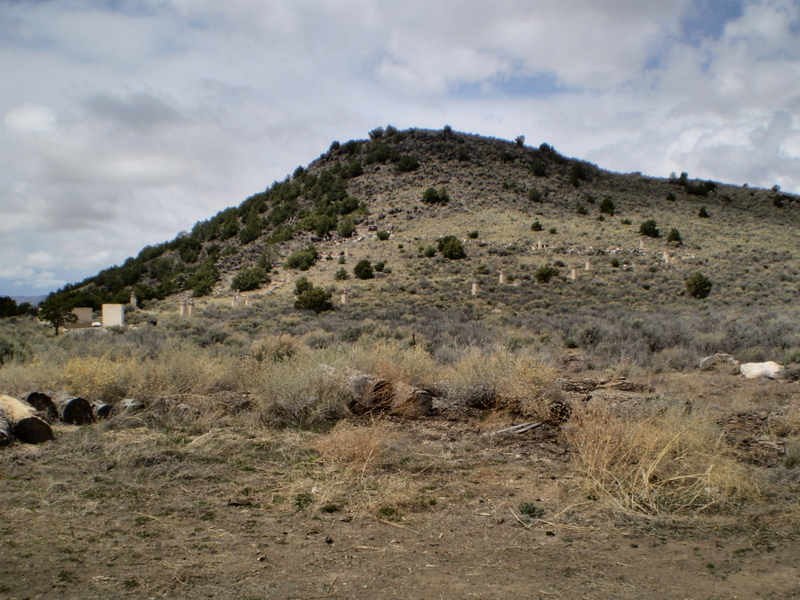 Nachtrieb and other settlers took sides against Elijah Gibbs, believing he was responsible for the murder of George Harrington June 17, 1874 and later, the deaths of the Boone brothers and Finley Kane of Poncha Springs when the mob tried to burn Gibbs and his family out of their small log cabin and hang Gibbs. 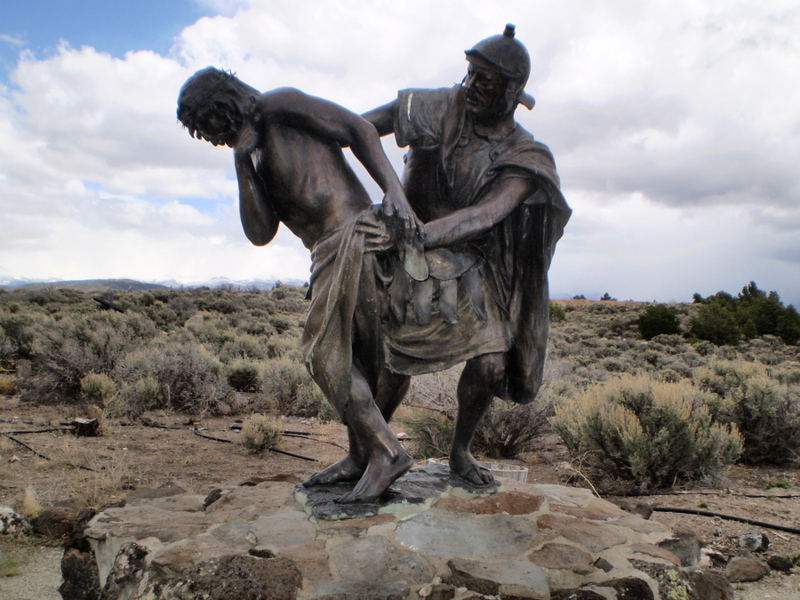 Outrages and physical abuses were committed by the mob against locals who sided with Gibbs and his claim of innocence. When the son of Father Dyer, Judge Elias E. Dyer was assassinated in his Granite courtroom by members of the mob on July 3, 1875, witnesses became fearfully silent as to the identity of the killers. 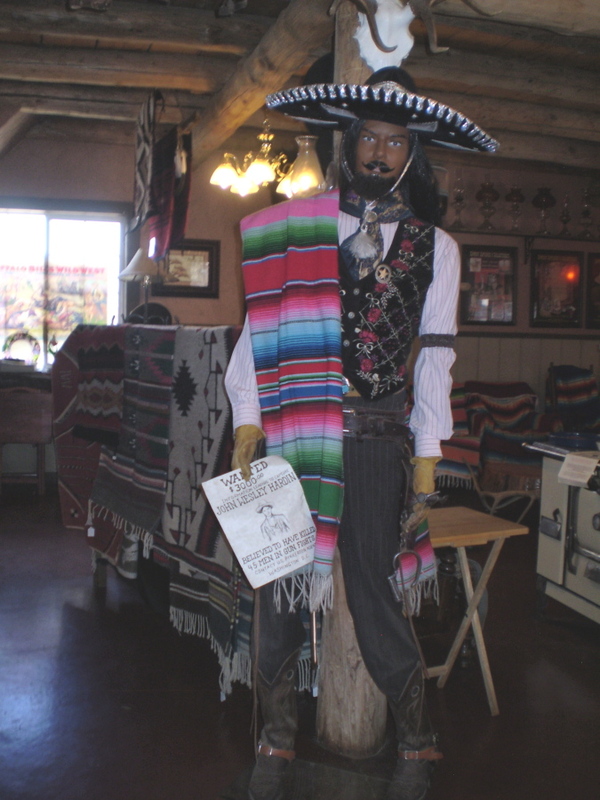 Nachtrieb was mysteriously murdered in his Nathrop store on October 3, 1881. He was found by his wife, shot though the back of his head. It is said that the bullet had also shot off his thumb and went through a letter that he had been reading. His tombstone is the only one left in the county that has the word “Murdered” inscribed in the stone. 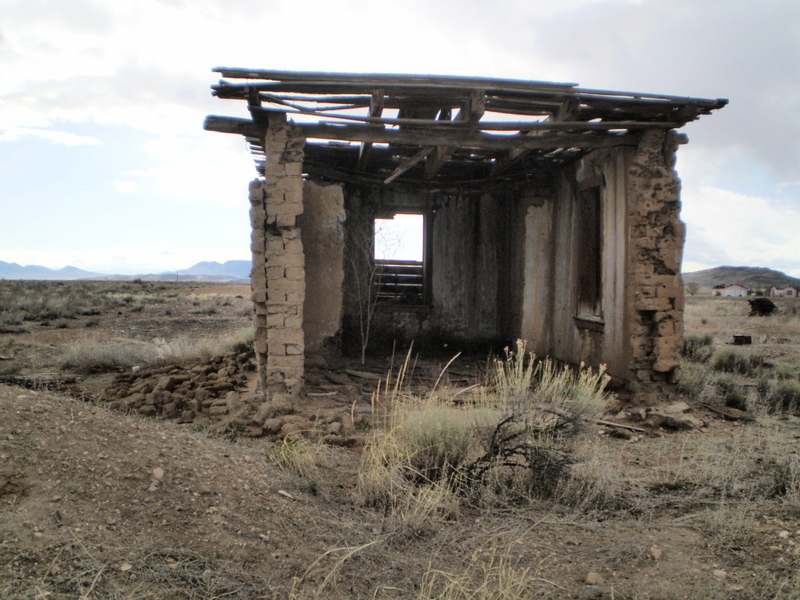 Margaret Nachtrieb proved to be equal to efficiently run the ranch, businesses and raise and provide her children with excellent educational opportunities at the same time. 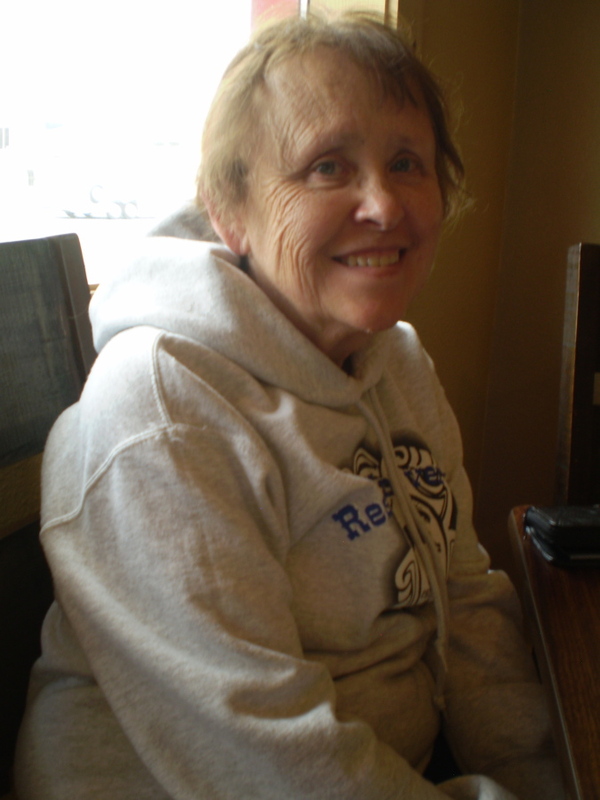 She became a much admired and respected business woman in the community and Chaffee County. George Harrington was shot in the back when he went out to extinguish a fire in an outbuilding on the night of June 17, 1874. Elijah Gibbs was the immediate suspect because he and Harrington had an argument a couple of days earlier. 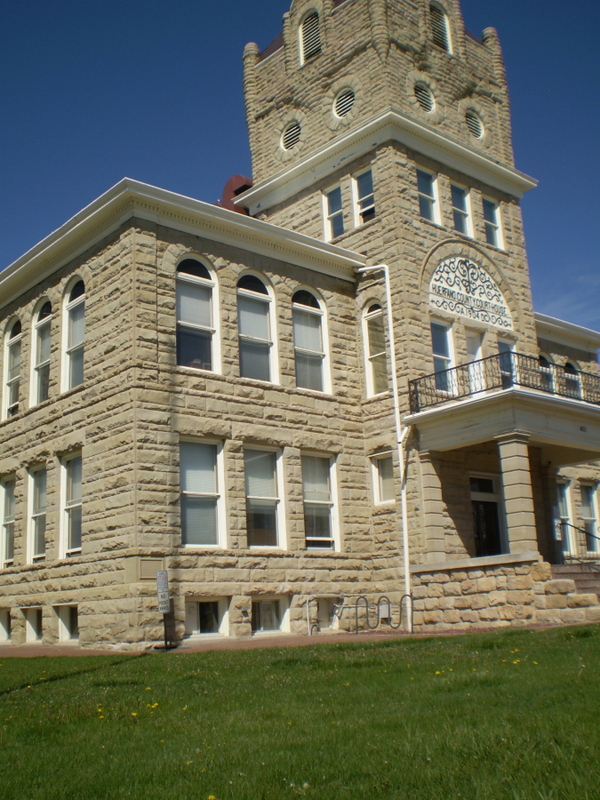 Gibbs was tried and acquitted for the murder in October in a Denver court. The venue was changed because of the inflammatory nature of the case. Gibbs returned to his farm in Lake County, but peace didn’t last. 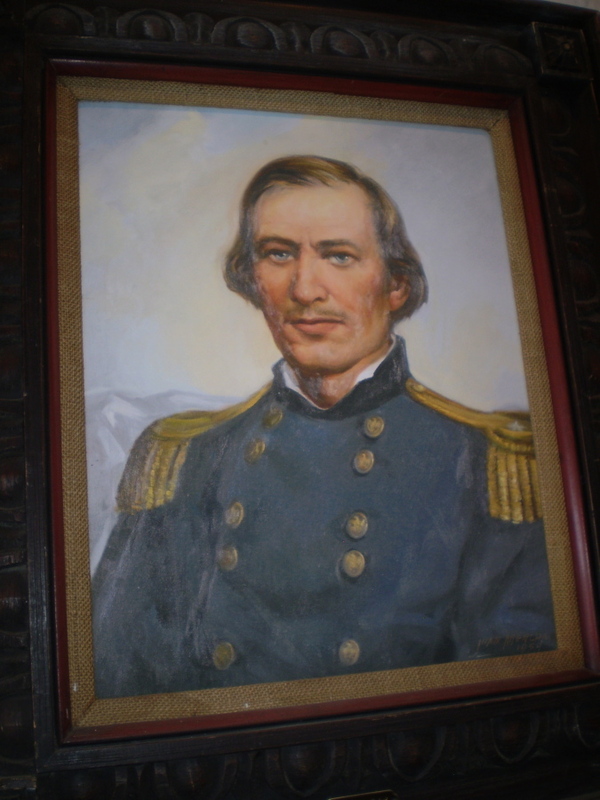 15 men showed up at Gibbs’ cabin on January 22, 1875 to hang him. They threatened to burn him and his family out of the cabin if Gibbs didn‘t walk out the door. They piled up kindling by the door, then as one of the men lit a match, Gibbs shot him and then fired more shots at the other men. 3 men were killed. Gibbs turned himself into the Justice of Peace, who held a trial the next morning. Wilburn Christison acted as the defense for Gibbs. 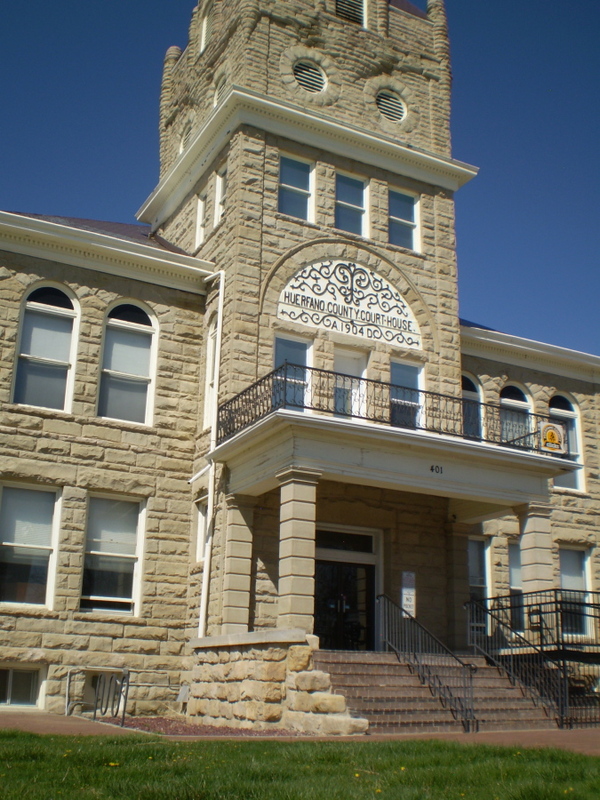 The court found that Gibbs acted in self-defense. Gibbs immediately left the area. Denied their revenge, the men formed a vigilante group called “The Committee of Safety.” They rounded up friends and supporters of Gibbs and held a trial where a noose was hanging over the witness’ chair. This was placed around the witness’ neck and tightened when the committee found his testimony unsatisfactory. The line of questioning concerned whether the witness believed Gibbs had shot Harrington or not. 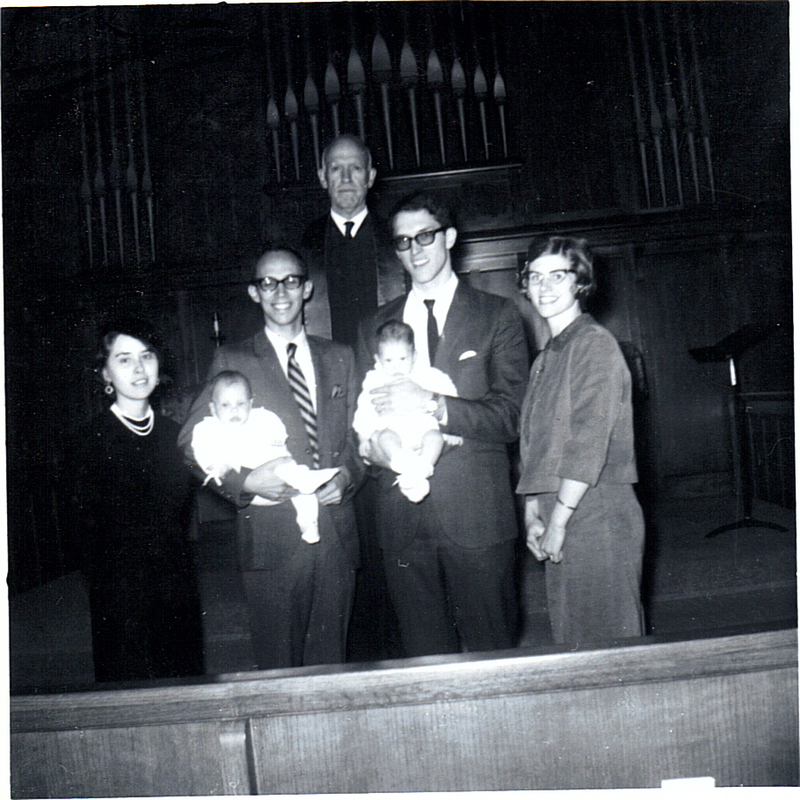 Two of Wilburn’s sons, Leslie and Ernest, were questioned by the Committee of Safety. The Lake County War culminated when Judge Elias Dyer, who had also been questioned by the Committee, swore out warrants for the arrest of 16 members of the Committee of Safety. 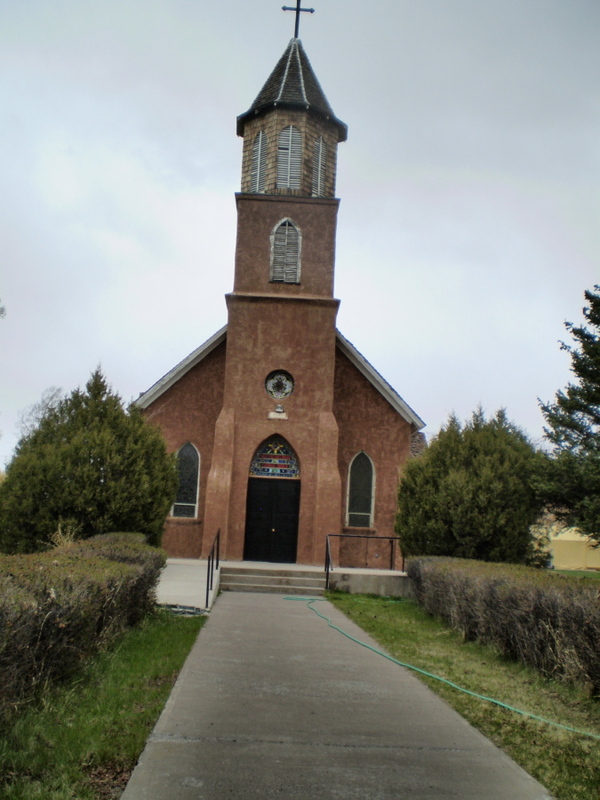 Thirty armed men arrived in Granite on Friday, July 2, 1875. The next morning, Judge Dyer called court to order, but had to dismiss the case because the witnesses were too afraid to testify. After everyone left the courtroom, five men walked back in and assassinated Judge Dyer. No one was ever charged with the murder. The people of the county went on with their lives; the Lake County War died out, but the terror of the vigilante justice and secrecy of the conflict affected the people the rest of their lives(3). “With a rapid influx of settlers, prospectors, and miners, and the rough element that came with the building of the railroads, things were considerably unsettled; and as in all newly organized territories, the machinery for law enforcement had considerable difficulty in functioning. More than one hundred homicides occurred during this period without a single conviction; it being almost impossible to get witnesses to swear to the killings” (4). Ernest Christison and Ed Watkins had a partnership and owned cattle together. Christison took his share to sell over at Gunnison and Watkins kept his. 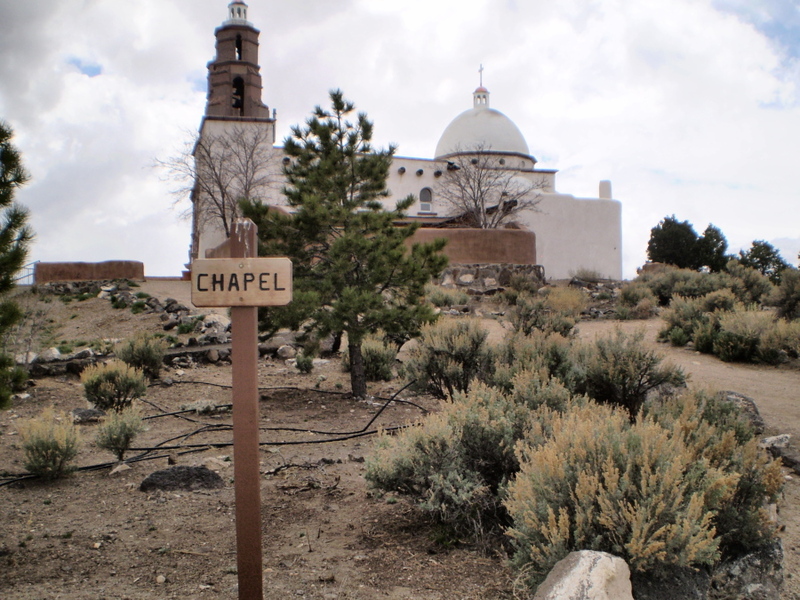 While moving his cattle to Gunnison, Christison was arrested for having stolen cattle near St. Elmo. After Christison was arrested, the cattlemen went to Watkins’ ranch and drove away 21 head of cattle they claimed as their own and had Watkins arrested. 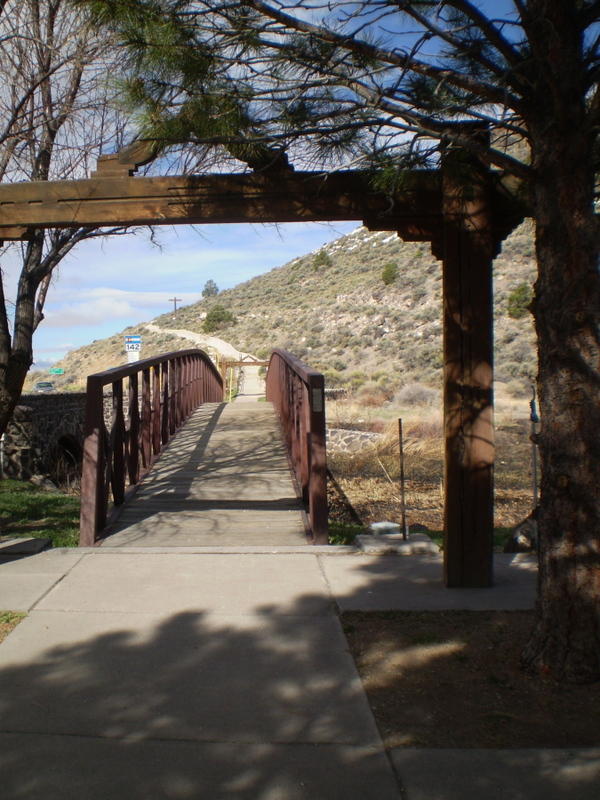 While Watkins was in the custody of the sheriff, a mob captured him and hanged him from the 1st Street Bridge in Canon City. Christison was released from jail on bond, but made the wrong move when he visited a dancehall with Frank Reed in October. 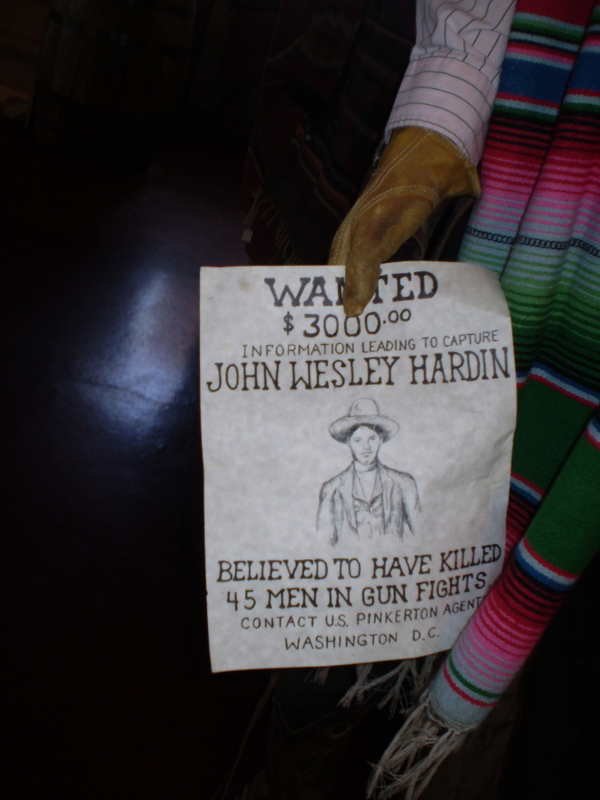 Baxter Stingley, the Salida Marshall, showed up with a warrant for their arrest and Reed shot and killed Stingley. 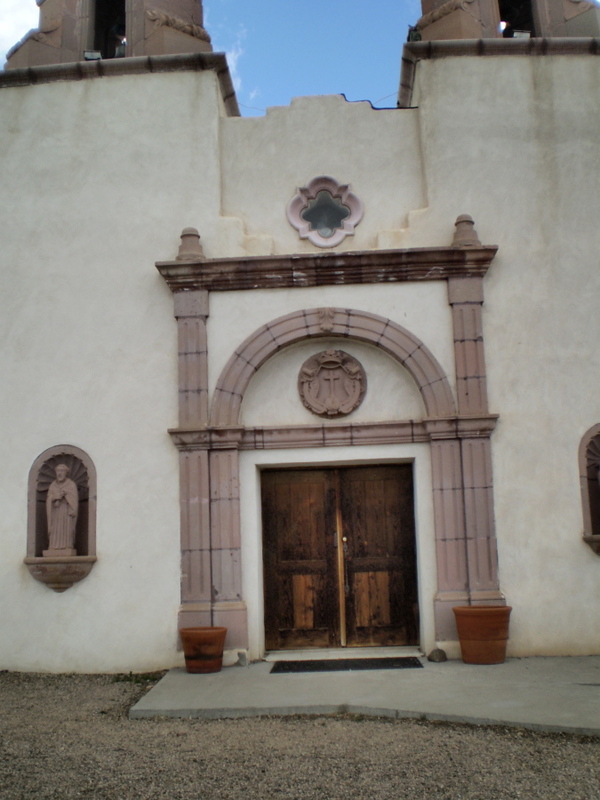 Christison was arrested again and jailed in Buena Vista. Life was quiet for a while, then Christison was one of 11 prisoners who escaped from the jail on January 27, 1884. His freedom didn’t last long as he was captured the next morning. 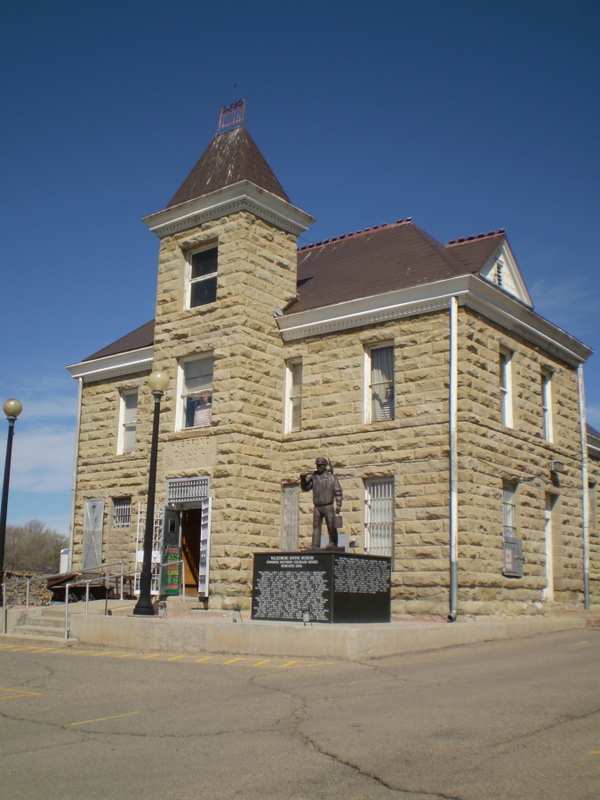 He changed his “not guilty” plea to “guilty” on the charge of grand larceny and on June 7, 1884 he boarded the train to Canon City to spend the next two years in the Colorado State Penitentiary (5). 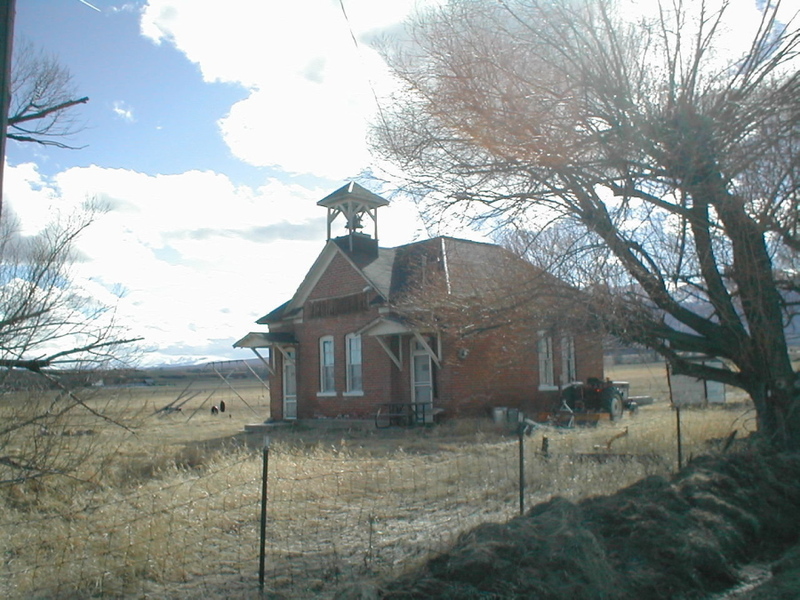 The old schoolhouse south of Nathrop was probably built in the 1880s, during the time of tension. So it may have been a witness to some of the violence. I imagine the old tree was planted when the school was built. If so, then it is approximately 120 years old. My next search took me to cottonwood trees and their lifespan. 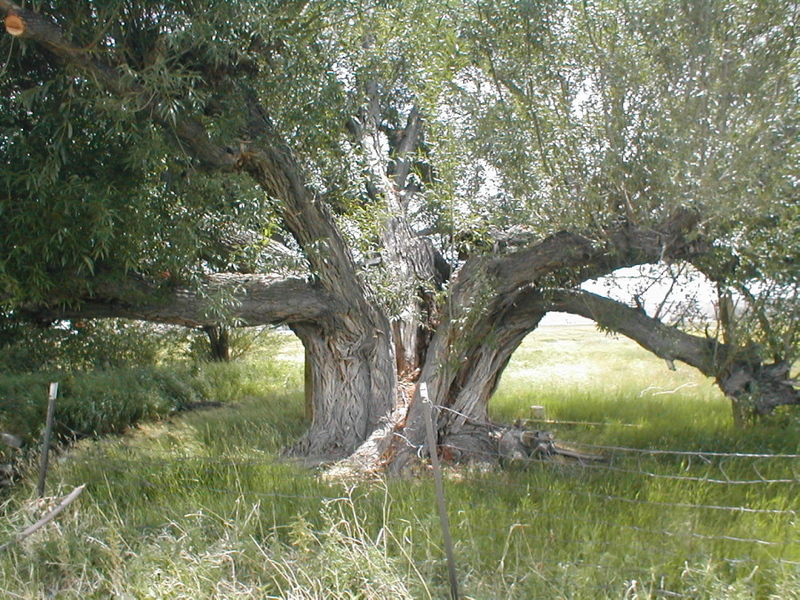 The Plains cottonwood is also the largest broadleaf tree of Colorado, New Mexico, and Wyoming. This tree grows from the eastern plains to 6500 feet in elevation, and possibly higher in canyons of the eastern slope of Colorado. Fairly young trees have a straight columnar trunk with a rounded crown; old trees are massive with heavy, wide-spreading branches. It can occasionally reach 6 feet in trunk diameter. 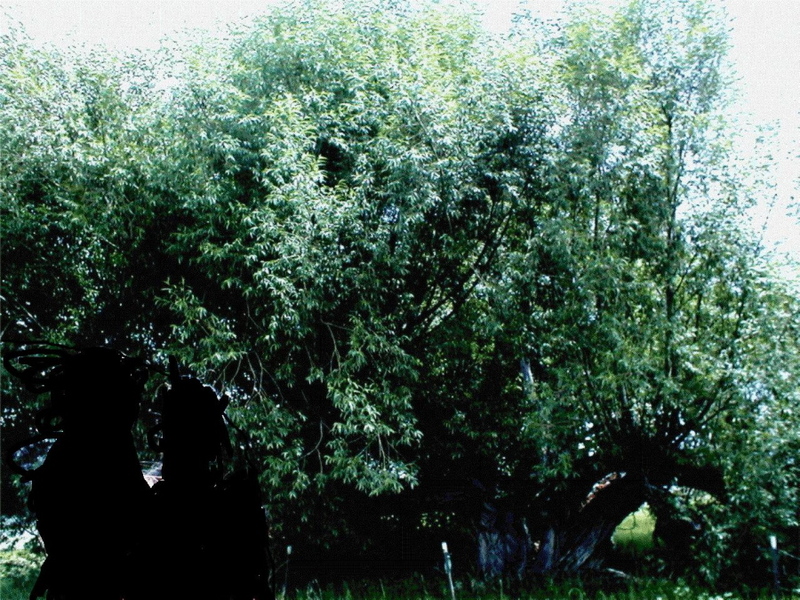 The largest recorded Plains cottonwood grows a few miles north of Boulder, Colorado. The cottonwood is short-lived; few exceed one hundred years by much. After a century or so limbs begin to die naturally. The thick bark sheds off over a period of a few years, leaving bare white limbs, the massive skeleton of the tree. The wood is fairly soft and weak. Sometimes the core of the tree completely rots away before the living tissue under the bark is destroyed, especially if the tree is damaged by fire or loss of a limb. Wind or decay will eventually bring the limbs, and sometimes the entire tree, to the ground. High winds blowing out of the mountains sometimes blow over live trees as well as dead ones, the weak shallow roots snapping off. When an entire tree is blown over the wreck is mighty indeed since the limbs shatter, scattering wood fragments of every size in all directions. Old-time westerners know not to hold a picnic under a cottonwood with dead limbs, wind or no wind (6). 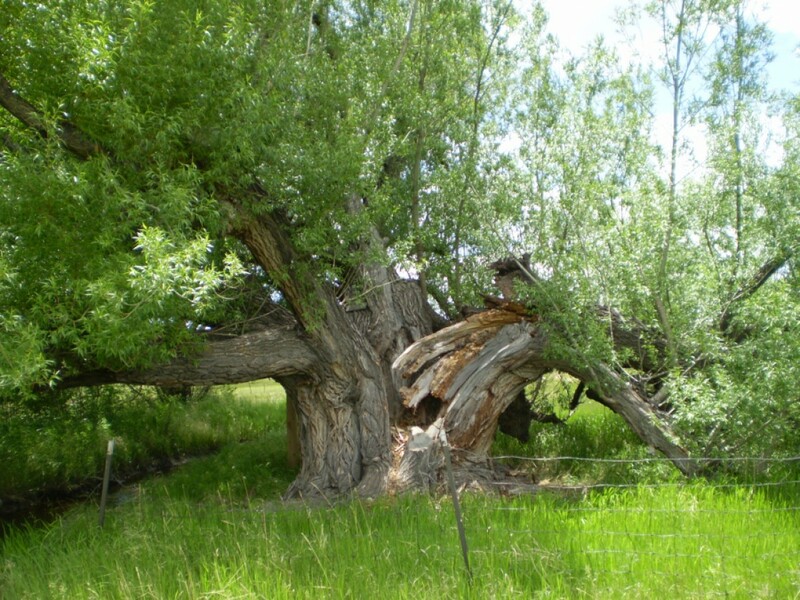 Occasionally cottonwood trees can reach an age well over one hundred years. 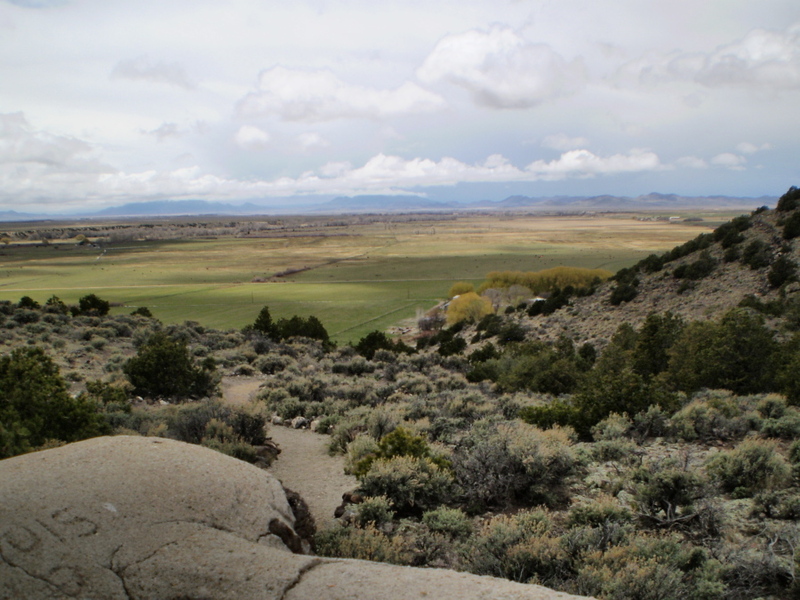 Paul Cutright, when preparing his book Lewis and Clark: Pioneering Naturalists , found two large and very old cottonwoods in an otherwise treeless location in Montana where Captain Clark had camped by two cottonwood trees. If they were the same trees, they were over 170 years old.(7). Though the wood of this tree is moderately weak, it was the only wood available to early settlers on the plains and was sometimes pressed into use as timber. 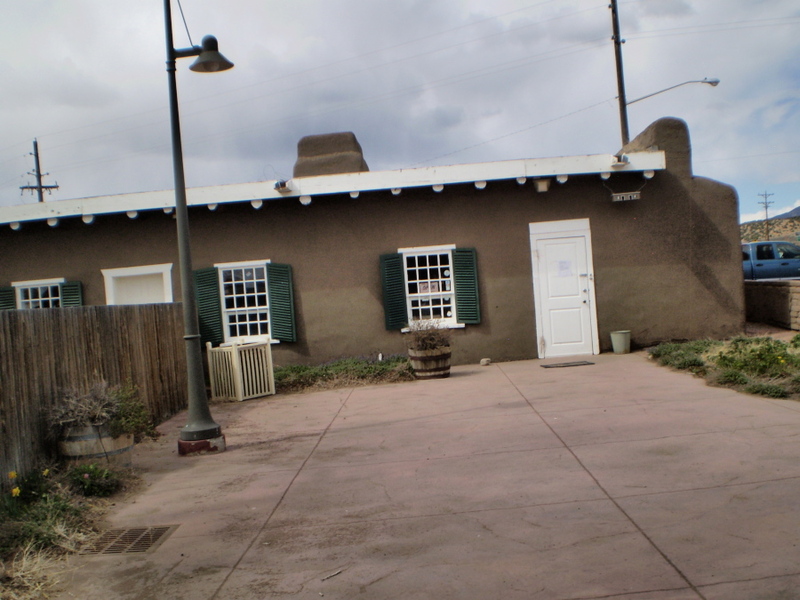 The vegas — horizontal roof beams — of the adobe dwellings characteristic of the southwest are sometimes made of cottonwood. 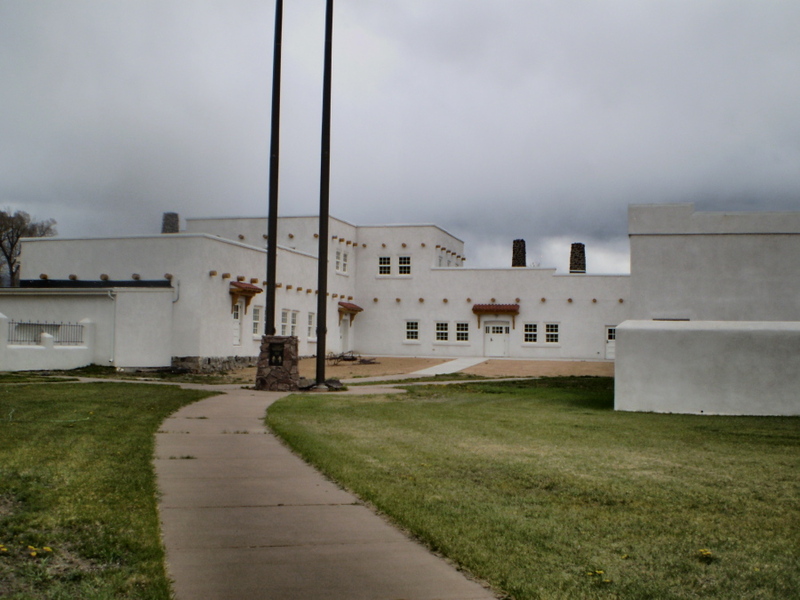 Fine examples are the vegas of the reconstructed Bent’s Fort near La Junta on the Arkansas River. Cottonwood is easy to carve and cottonwood root is the traditional material for the Kachina dolls of the Hopi of northern New Mexico, while drums are made of hollow logs. Cottonwood provides food for beavers (both bark and leaves) and stems for beaver dams and lodges. Deer and elk browse the twigs.(8). My old tree is on the eastern side of the divide! 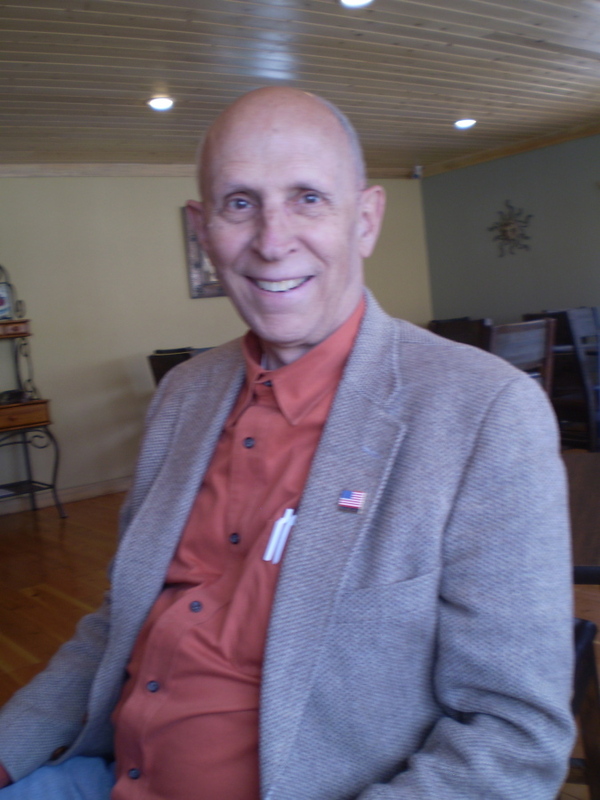 In May 2009, I finally retired from teaching after over twenty years of college composition instruction. Howard and I wanted to do something special, so we took a train ride from LaVeta, Colorado to the Sand Dunes and back to LaVeta again. A friend went with us on the trip. 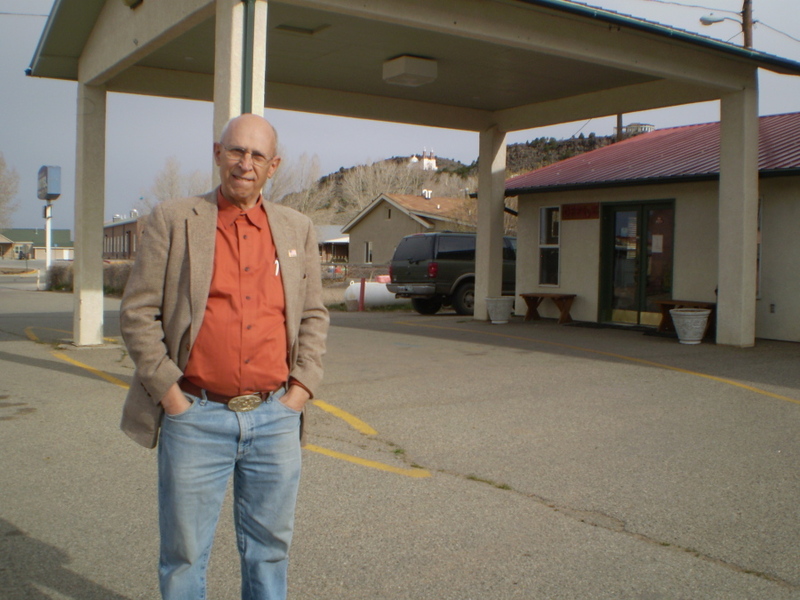 He had never been to the Rock Doc or to Chaffee County, so he wanted to visit some of the places we had mentioned. 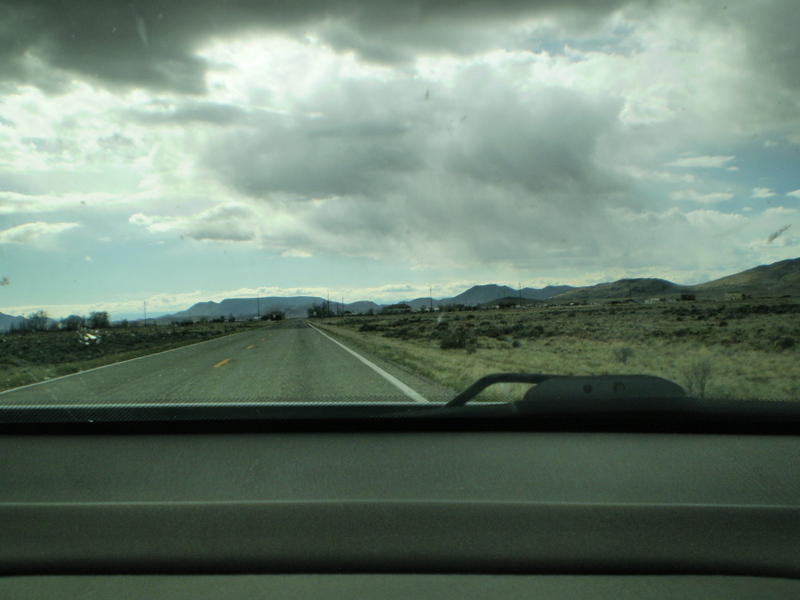 And that led us up Highway 285 in search of adventure. After the Rock Doc, we stopped at the old school again. The sign is still above the windows and is still unreadable, although it now looks more like “1881” instead of “1891”. The farm equipment is gone as is the picnic table that sat in front of one of the doors. The swings are still present, and the outhouse is still in back. Other than that, there is little change about the building. The tree, however, was a different story. One side of the tree had completely splintered from the trunk and had fallen to the ground. A combination of factors may have caused this to happen. If children played in a tree house, they would have weakened the tree in the beginning. Later, beavers may have accessed the trunk, causing the tree to splinter. 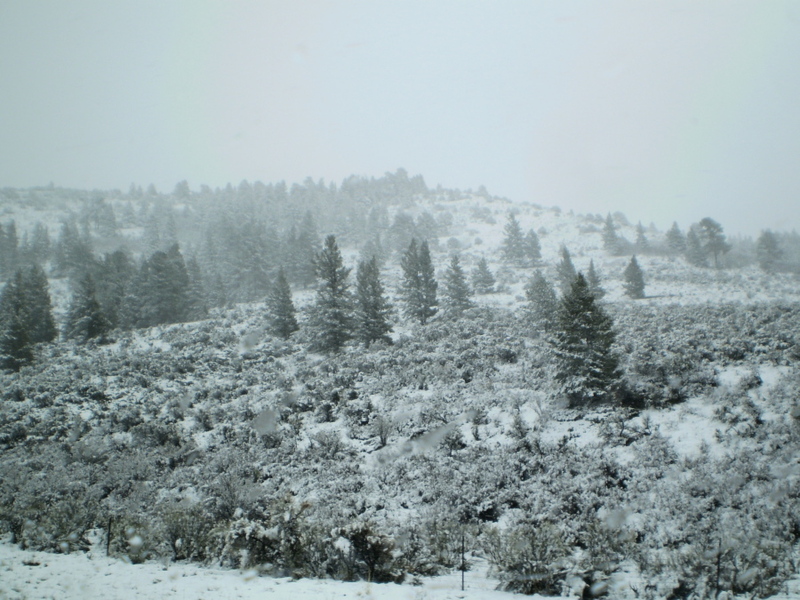 Weather was no doubt an additional factor, although between 2001-2005 or 2006, Colorado underwent a five-year drought with little precipitation during that period. Heavy blizzards between 2007 and 2009 would have weakened the structure further, causing part of the tree to fall. Since the fallen branches are still blooming in this picture, I believe that portion of the tree fell in the early spring. The rest of the tree is intact. 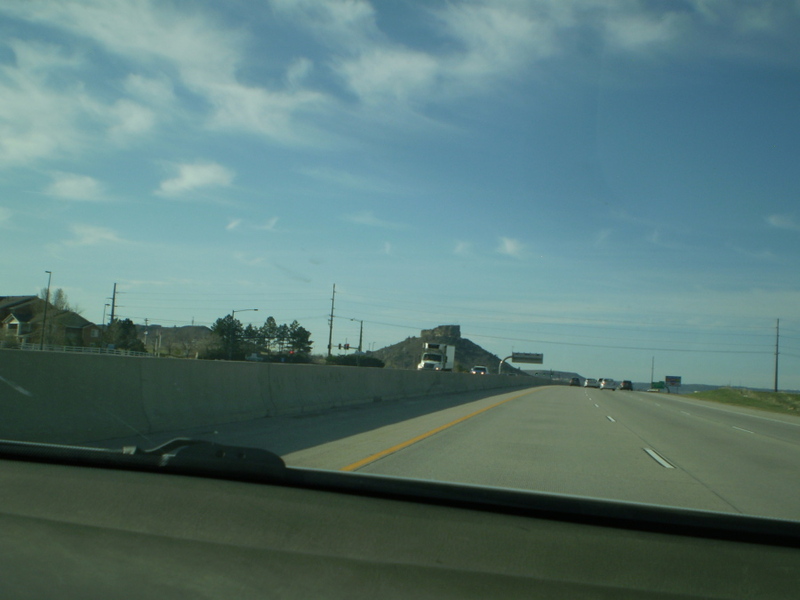 Passing visitors cannot see the fallen portion from Highway 285. 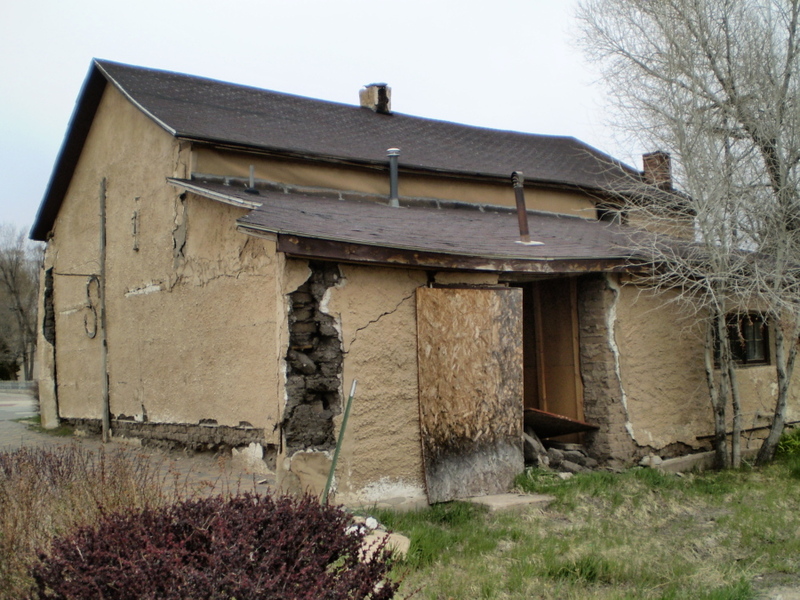 This condition still existed in July 2010 when we took Highway 285 south on another trip to south Colorado. 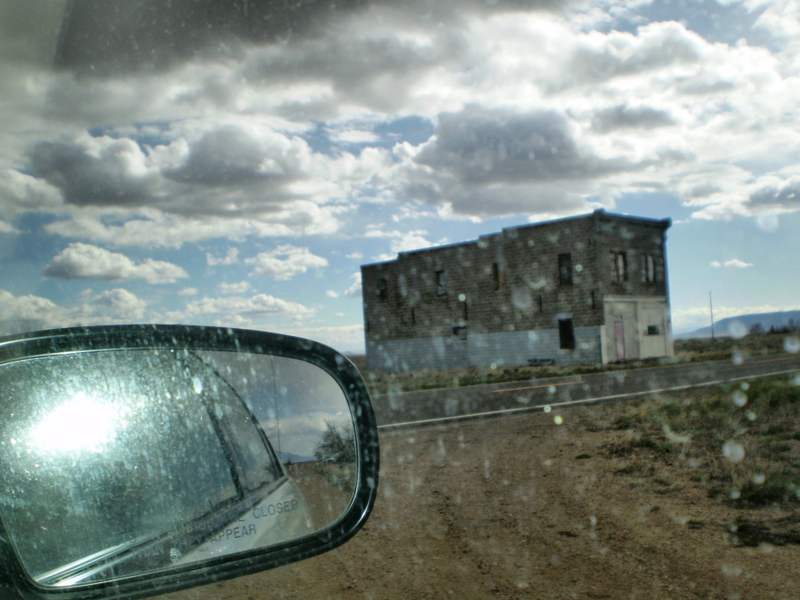 We didn’t stop this time, but I did snap a photo through the window of the car as we passed. I still don’t know the story of the school–its age or the community that it served. 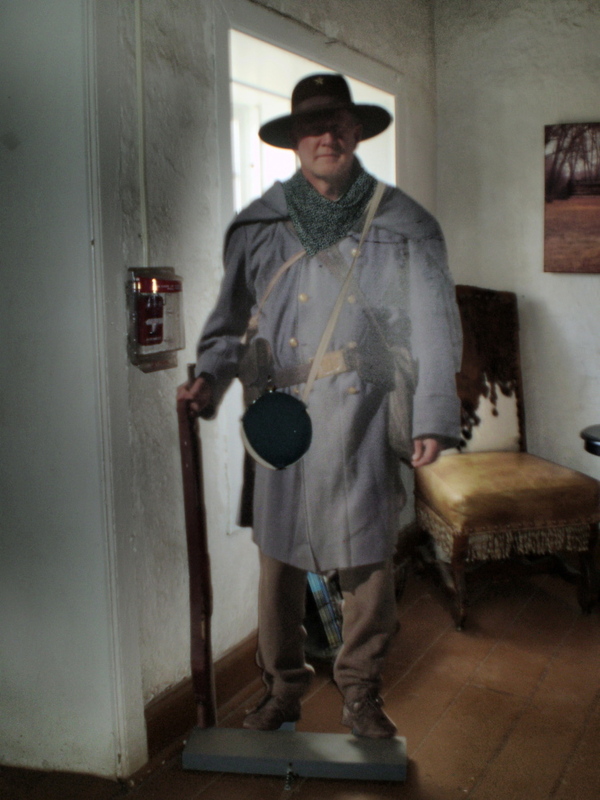 I don’t know whether it existed during the Lake County War or subsequent wars with cattle thieves. Nor do I know the full story of the tree. Perhaps I will never know all the answers, but there is one thing of which I am certain. Both images exhude a great deal of mystery and character, two factors binding me to them. And until I learn their full stories, I will continue to wonder! 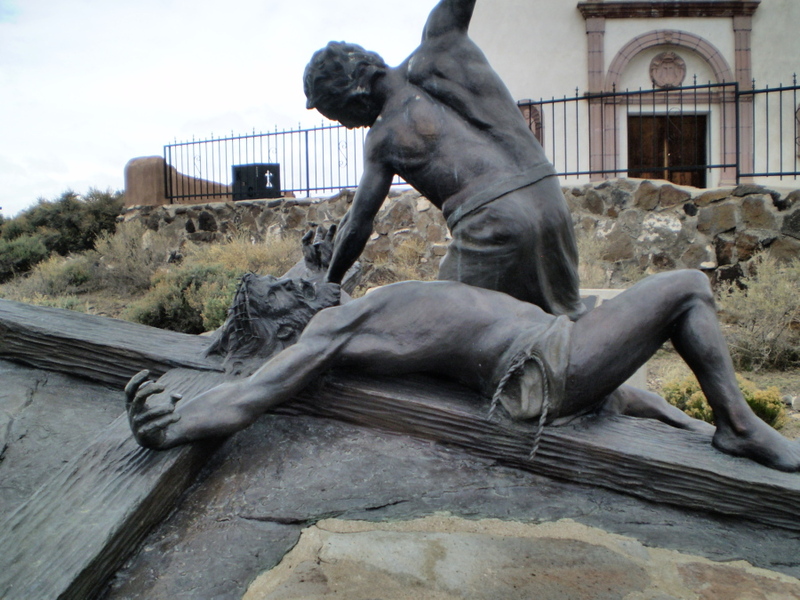 It was early Sunday morning, and we had another full day in San Luis. Tomorrow we would head up the interstate for home. I had just left my room and wandered into the guest area where the coffee was brewing. 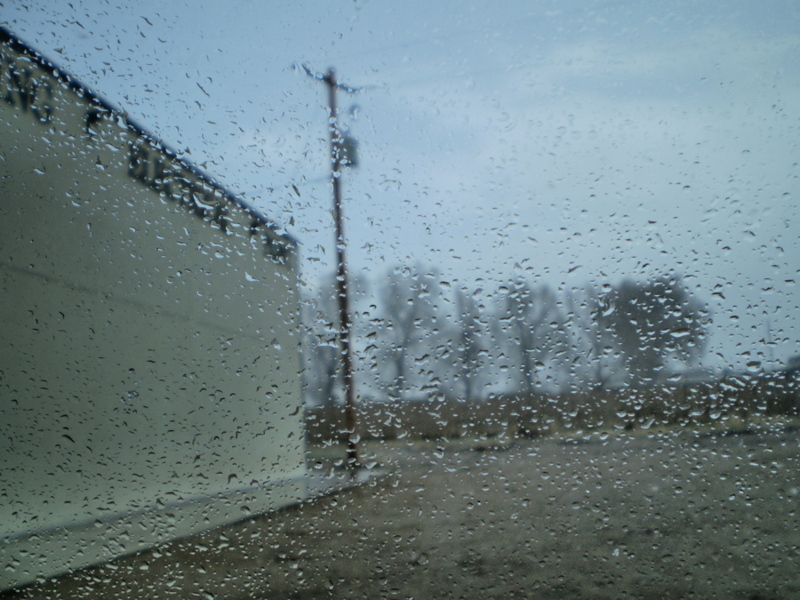 A glance outside indicated a cold, wet start to the day. And I encountered a woman fretting about it. 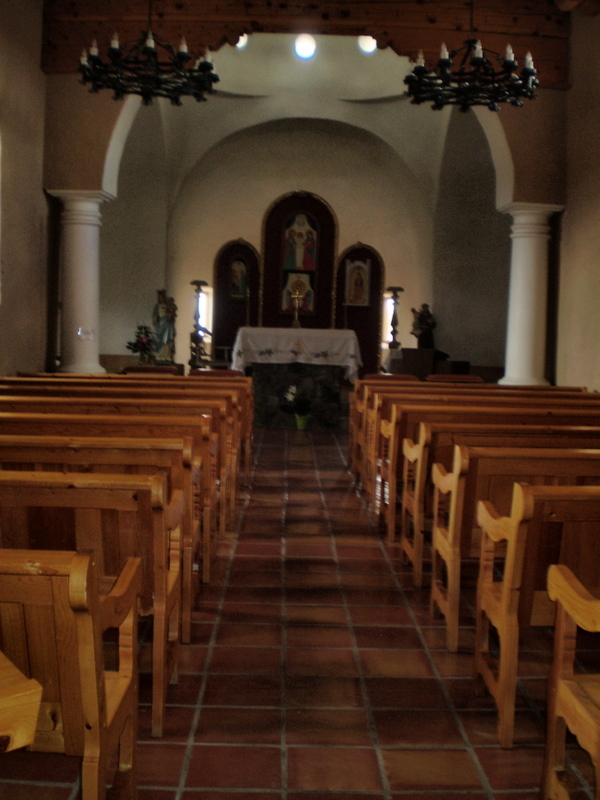 “You have to drive over LaVeta Pass to go to church?” I asked. Oh yes, I remembered how dicey it could be! 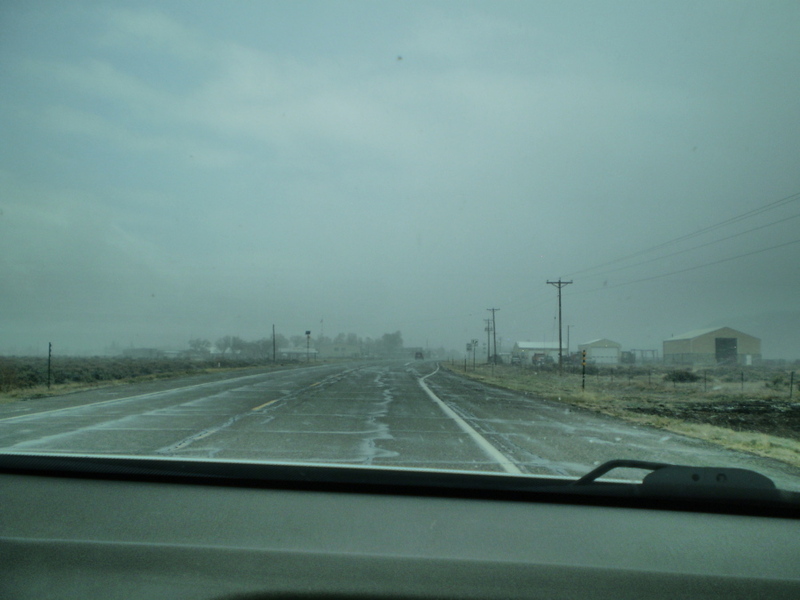 We crossed it in December 2007 with a blizzard right behind us all the way back to Denver. Well, we shouldn’t have too many problems, I decided. After all, we were leaving in the morning, so the weather could straighten out by then. The sun was shining when we left San Luis early the next morning–something that increased my optimism. However, the forecast was not favorable. 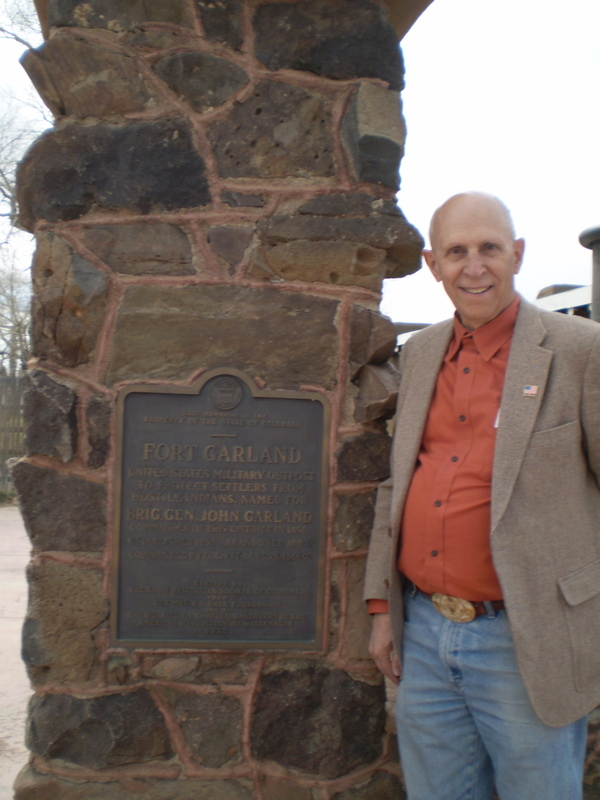 Snow started falling when we arrived in Fort Garland. We could barely see the Fort when we stopped at a store. 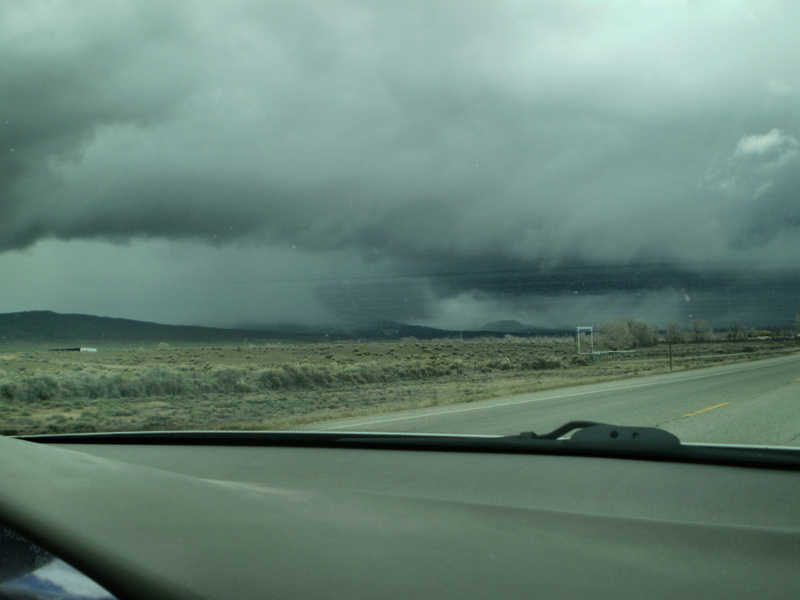 The weather calmed considerably when we reached LaVeta Pass, causing us to believe the storm was over. Our perception quickly proved not to be the case. And the road became dicey really fast! 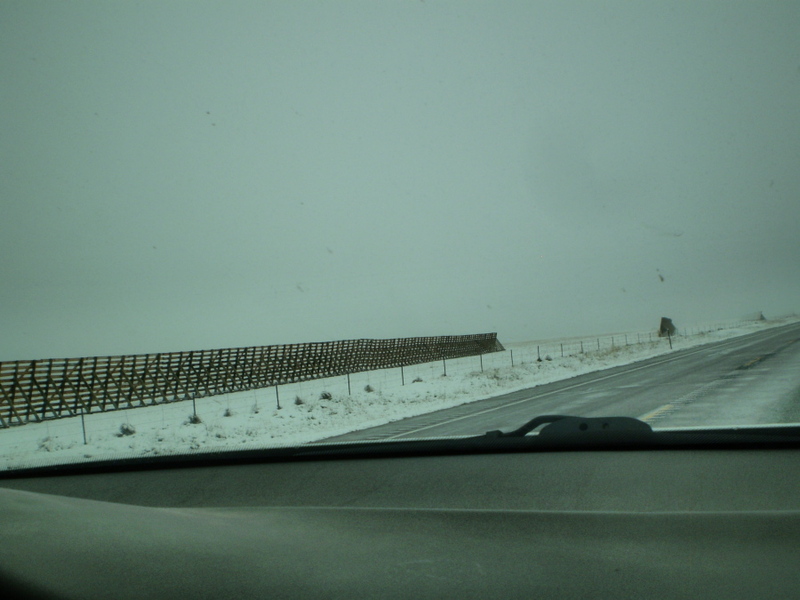 We certainly found out why the county maintains tall snow fencing beside the road! 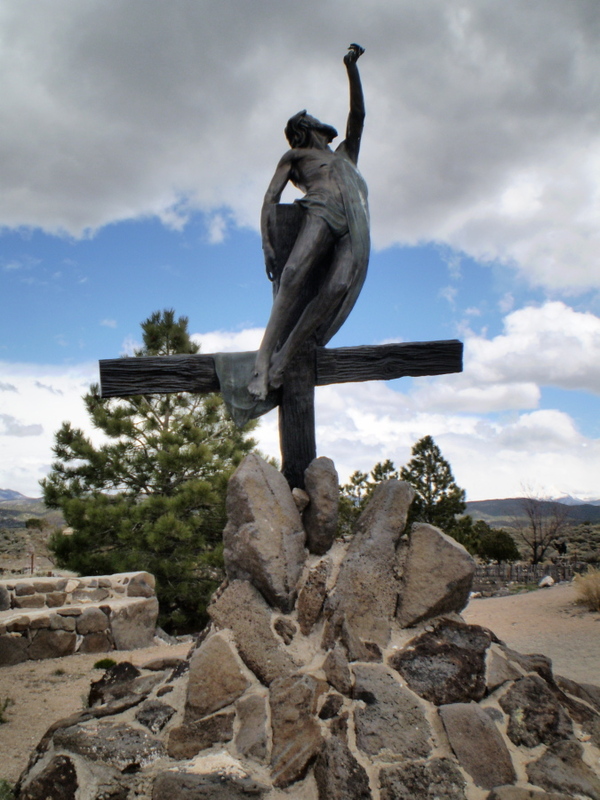 Walsenburg was a welcome sight! 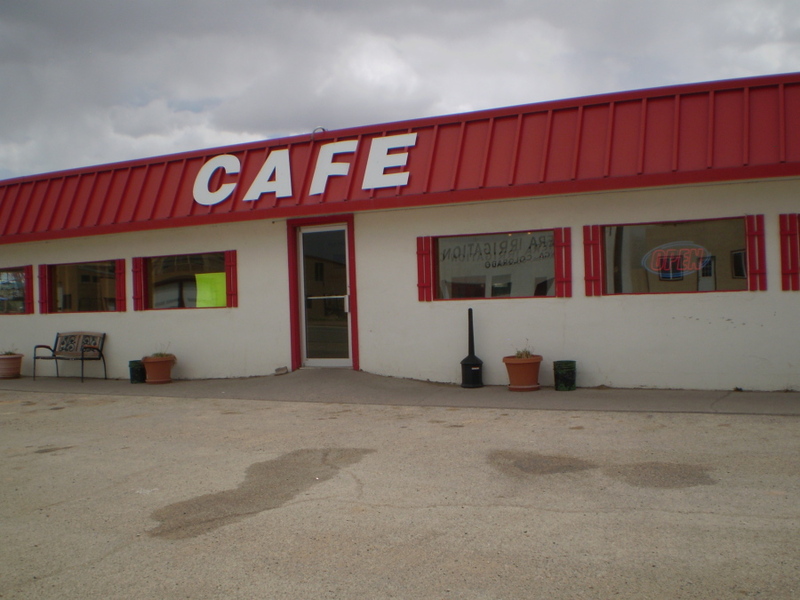 We stopped at a cafeteria on the edge of town. 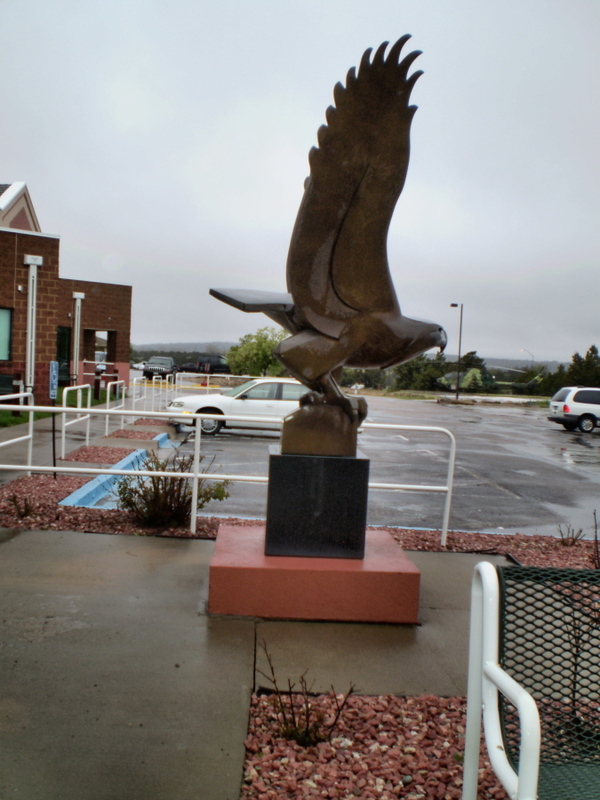 I took a picture of this eagle just outside the cafeteria door. 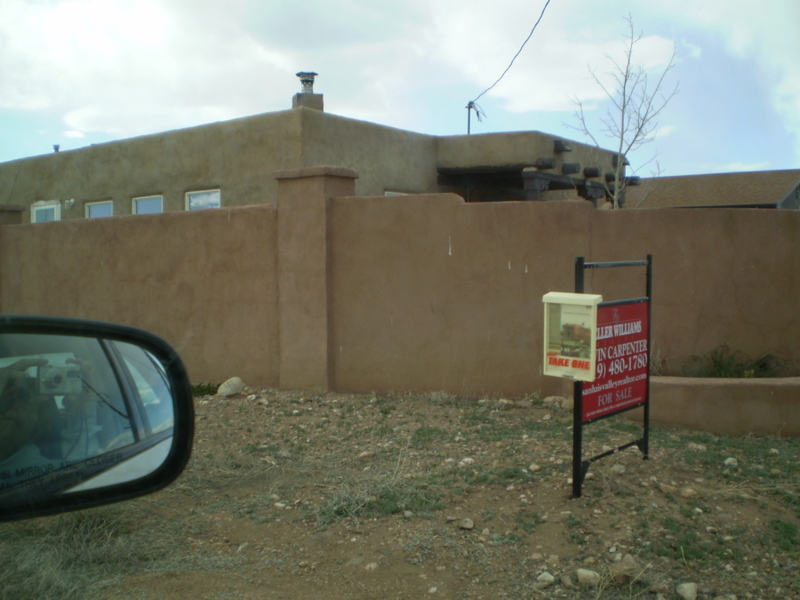 And I was really glad I had taken my pictures in Walsenburg two days previously. 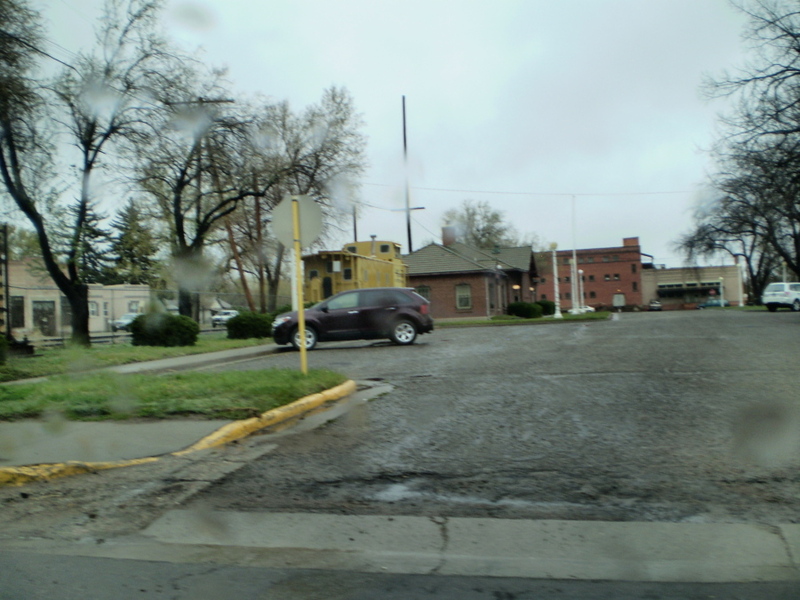 While it wasn’t snowing in Walsenburg on our return trip, it certainly was raining! 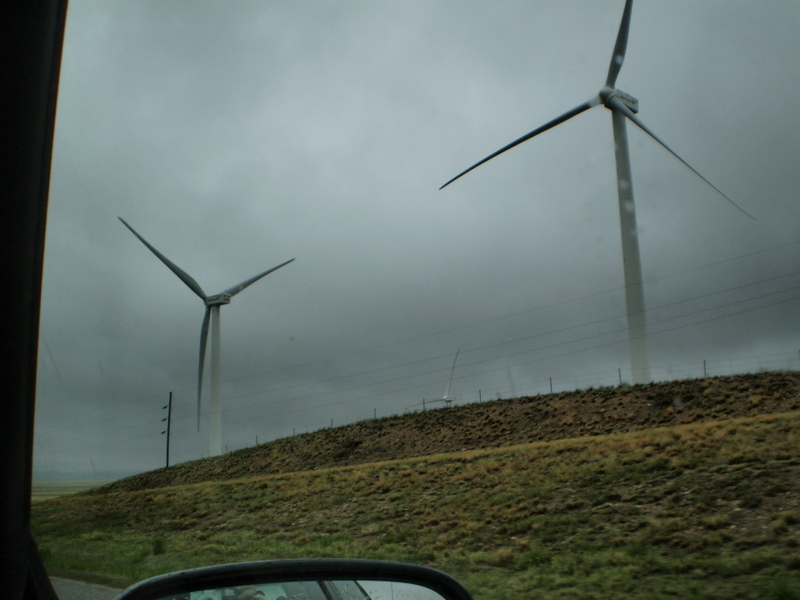 –only to start up again while heading north on I-25. 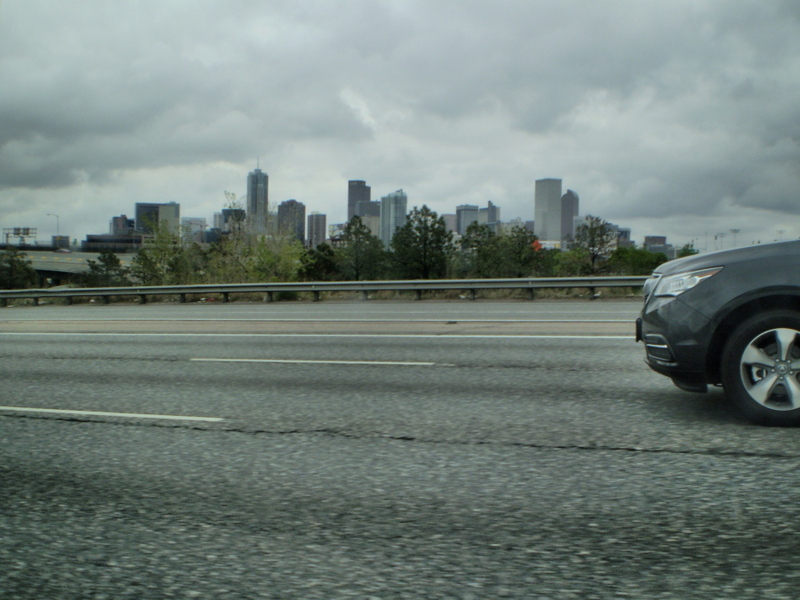 Presently, the Denver skyline came into view marking the end of a memorable trip and an interesting anniversary celebration. “So, what road are we going to take?” I asked. 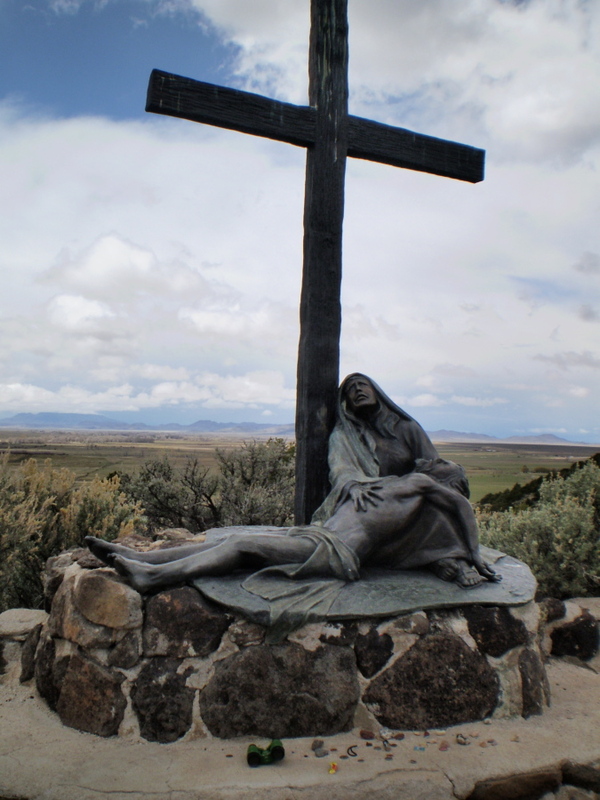 When we first decided to spend our anniversary in San Luis, Colorado, Howard suggested traveling Highway 285–a scenic route that would take us through the mountains. We would visit Fairplay and South Park, drive through Nathrop and stop at our favorite rock shop. 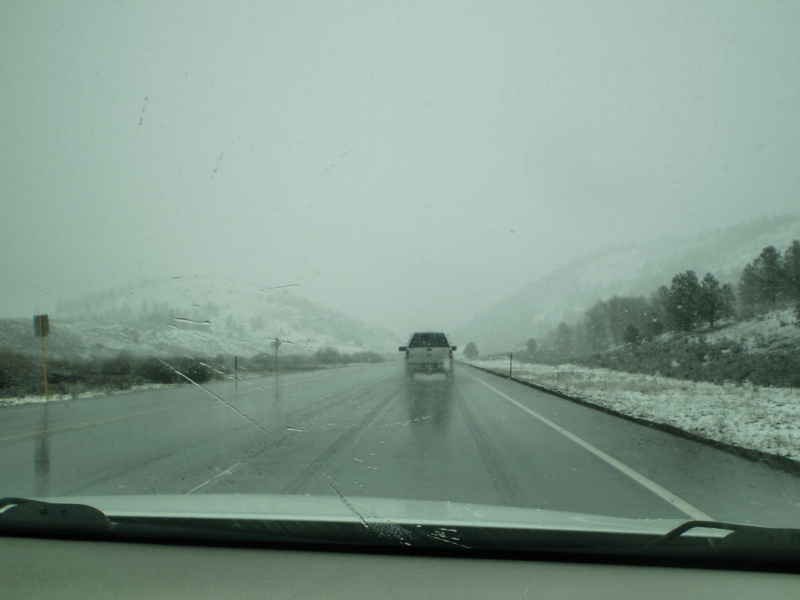 After listening to the weather the day before our departure, we nixed the 285 plan in favor of I-25. 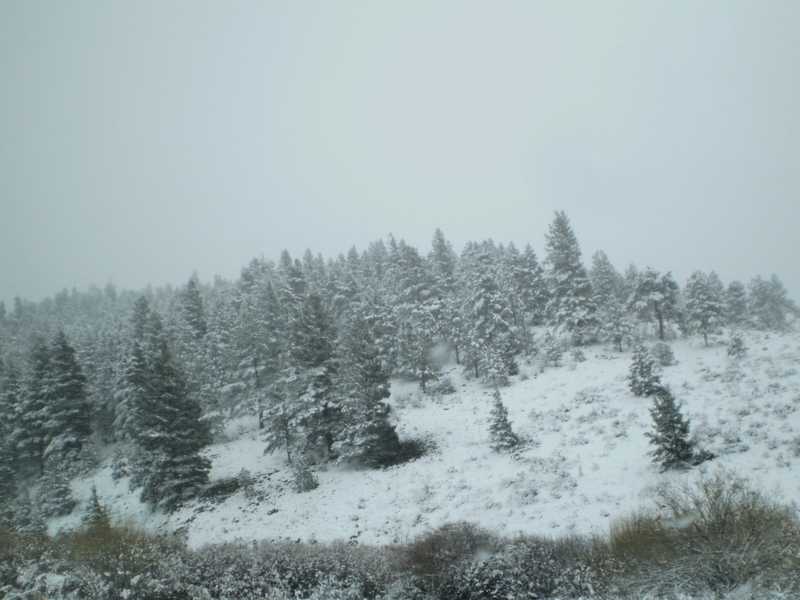 Typical of springtime in the Rockies, snow was in the forecast. So bright and early the morning of April 25th–our anniversary morning–we headed down I-25 in beautiful sunshine. A few clouds were in the sky; the sky was a royal blue. Since it was a Saturday morning, the traffic on I-25 was not heavy. 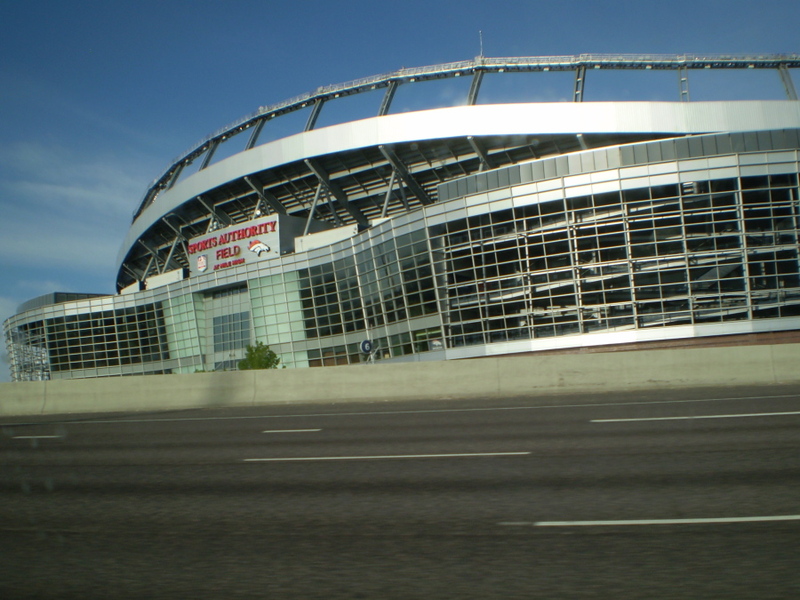 We sailed past the Bronco stadium and left Denver quickly. The rock at Castle Rock, Colorado soon appeared on the horizon. 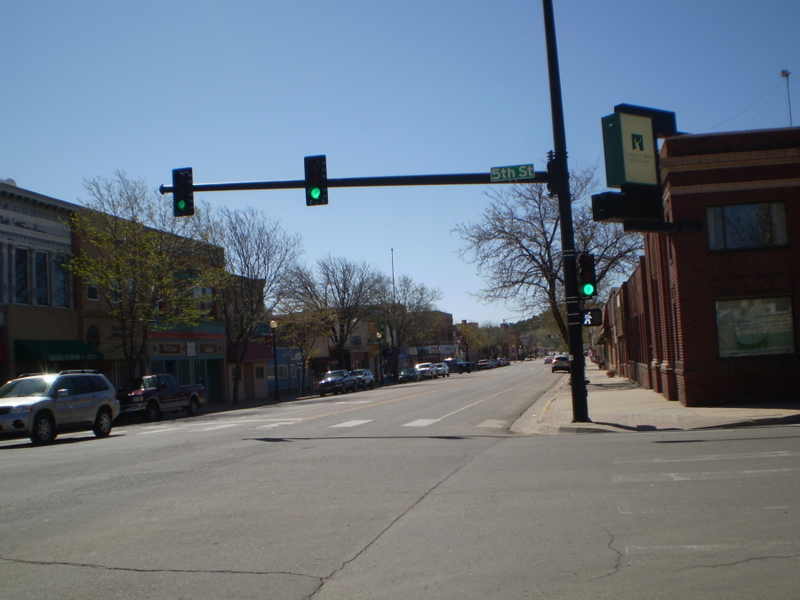 And by late morning, we turned off the interstate onto Highway 160, and headed west to Walsenburg–a town of interest to me. 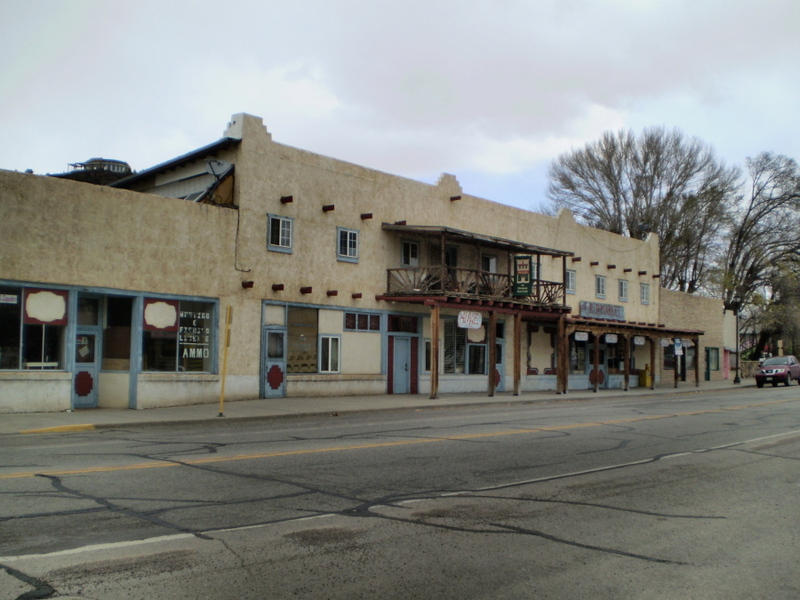 This wasn’t our first visit to Walsenburg, but it was our first since I discovered a family connection there. 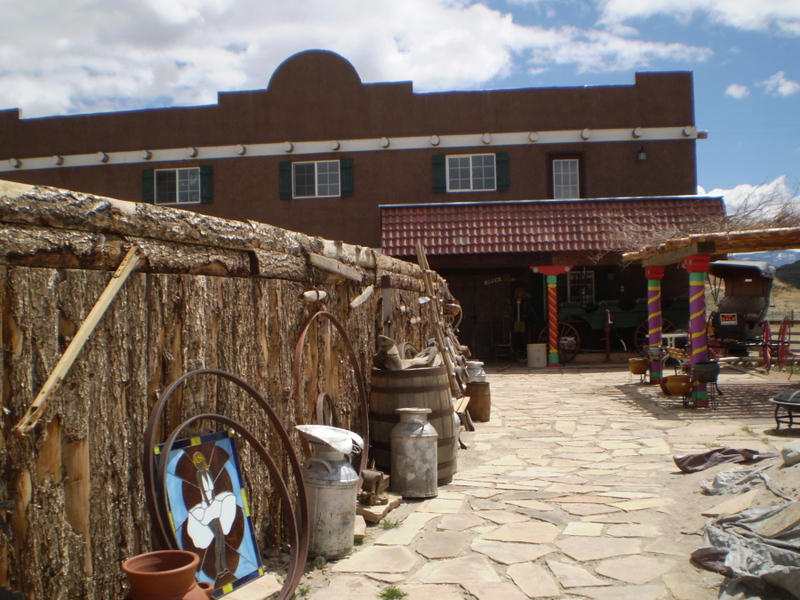 Established in 1875, Walsenburg became a bustling coal mining town. According to the 1880 Federal Census, my great grand uncle, John Stillians, settled there and went to work in a carpenter’s shop. John didn’t stay there long. 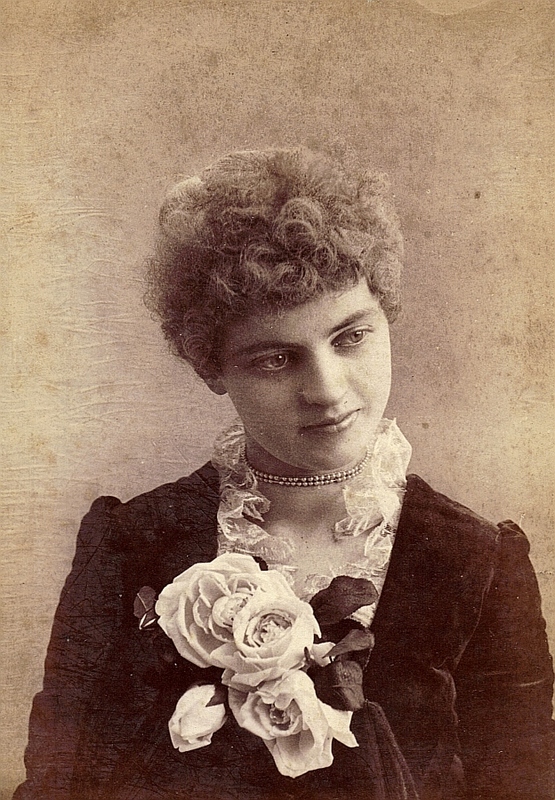 He was back in Iowa by 1881 or 1882, but he returned Colorado in 1886 where he married his first wife Marianna Augusta “Mamie” Pritchett–an actress, singer and dancer–in Pueblo. Marianna Augusta Pritchett (1868-1958)–first wife of John E. Stillians: her wedding photo. The couple relocated to Gainsborough, Florida after their marriage, thereby severing their ties with Colorado. Howard and I had probably been in Walsenburg five or six times before I discovered this connection. 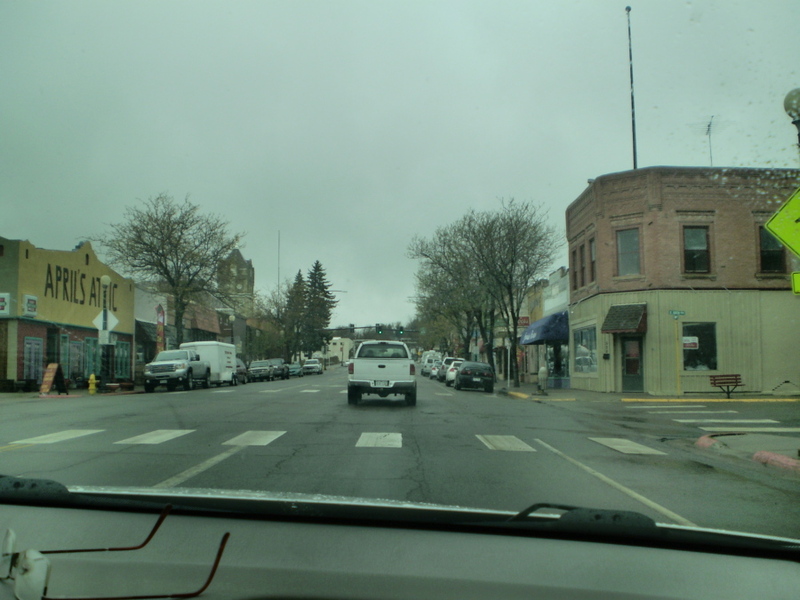 One thing we quickly learned about Huerfano and Costilla Counties on our anniversary trip: most communities there practice a four-day work week. If you have any business to conduct on Friday–forget it. 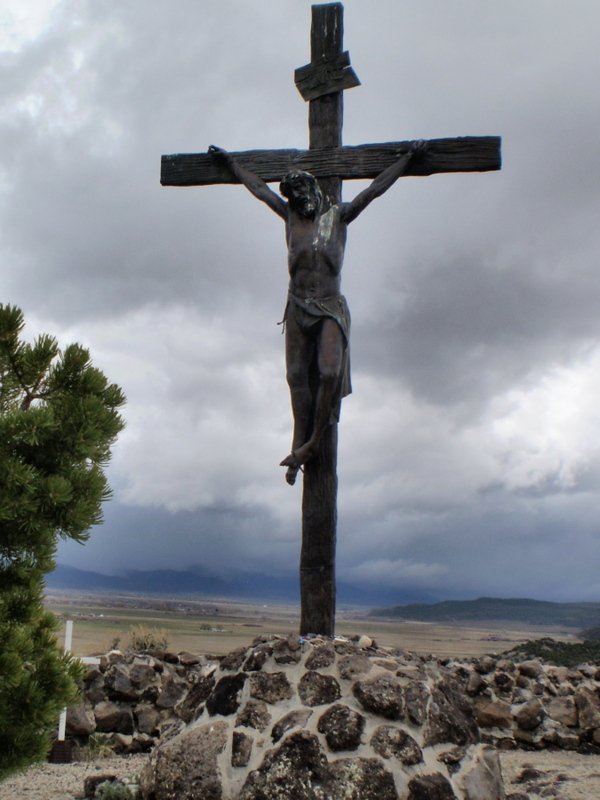 We were in Walsenburg on Saturday. The courthouse was closed. I wasn’t too certain about the mining museum behind the courthouse, however. 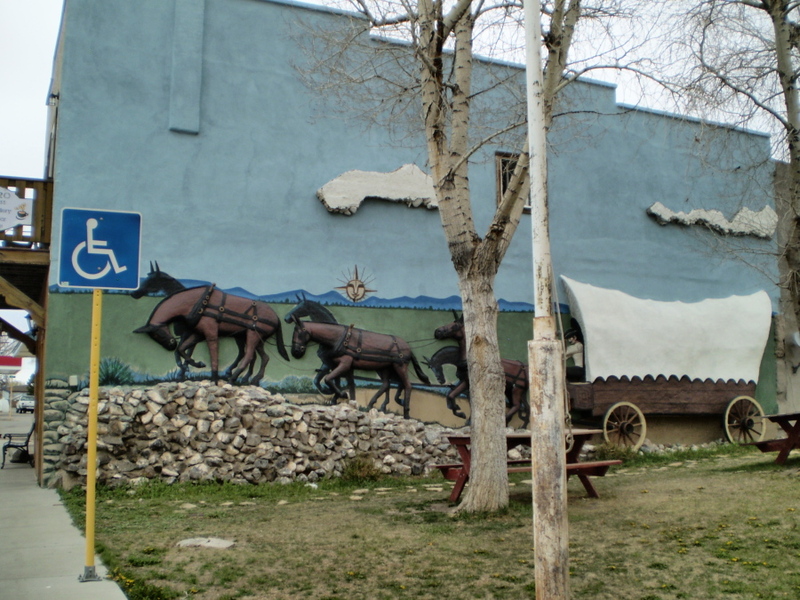 Originally the jail, the old building had been converted into a museum. Someone told Howard the museum had closed since “few people are interested in coal mining any more.” I did see a woman unlock the door and disappear inside, but she closed the door behind her. I didn’t inquire and headed up town to find Howard. 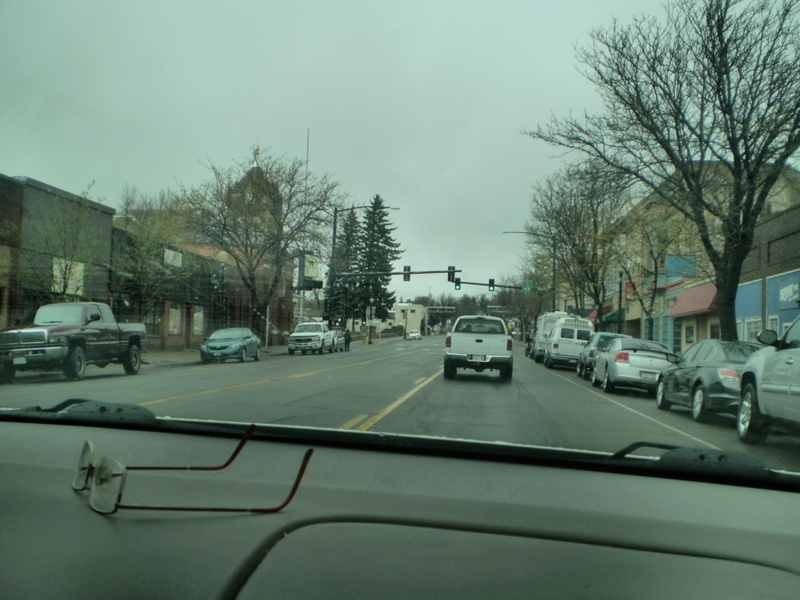 Walsenburg, Colorado on a Saturday morning. 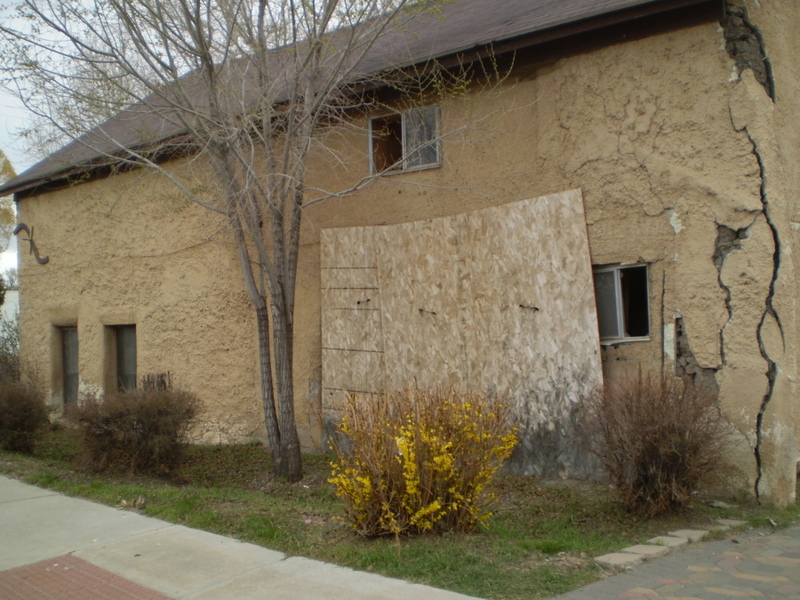 Many of the buildings were for sale. 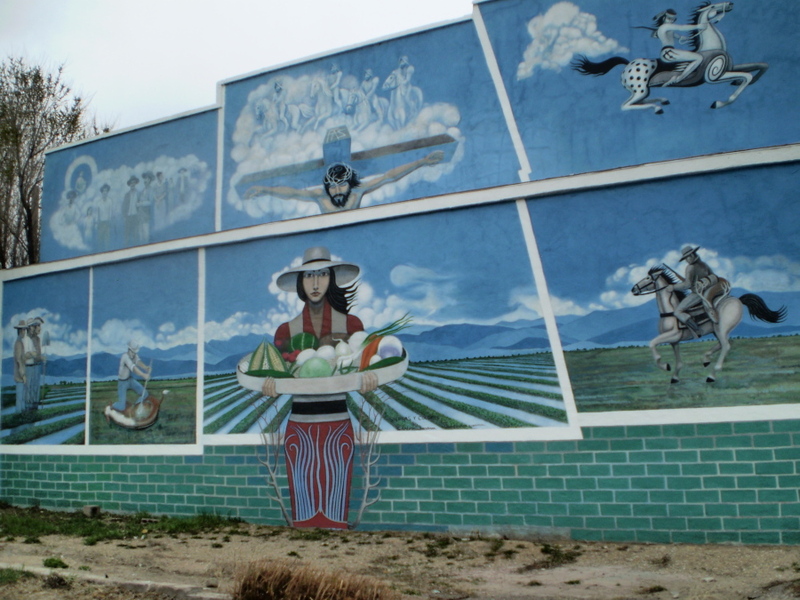 A sad fact about Huerfano and Costilla Counties is that they are the poorest counties in Colorado. 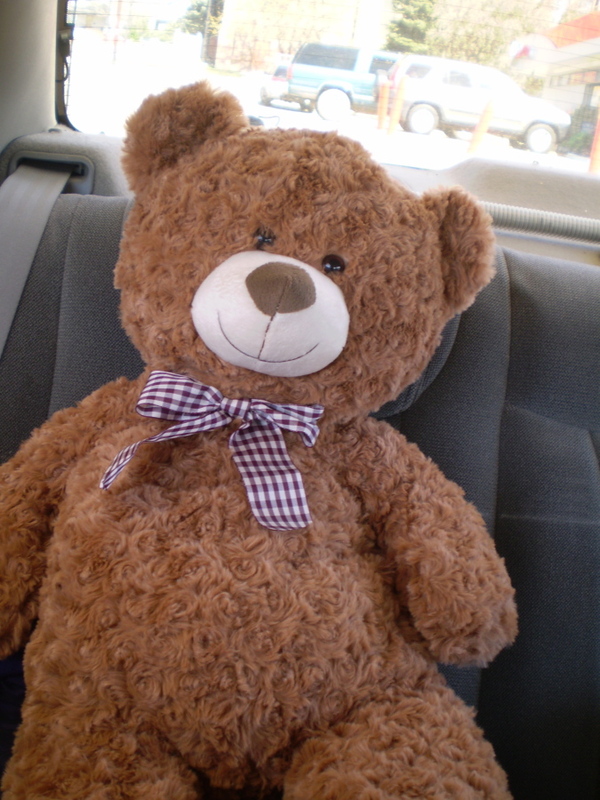 We discovered a flea market open, where I acquired a large brown bear I named Walsenburg for the occasion! 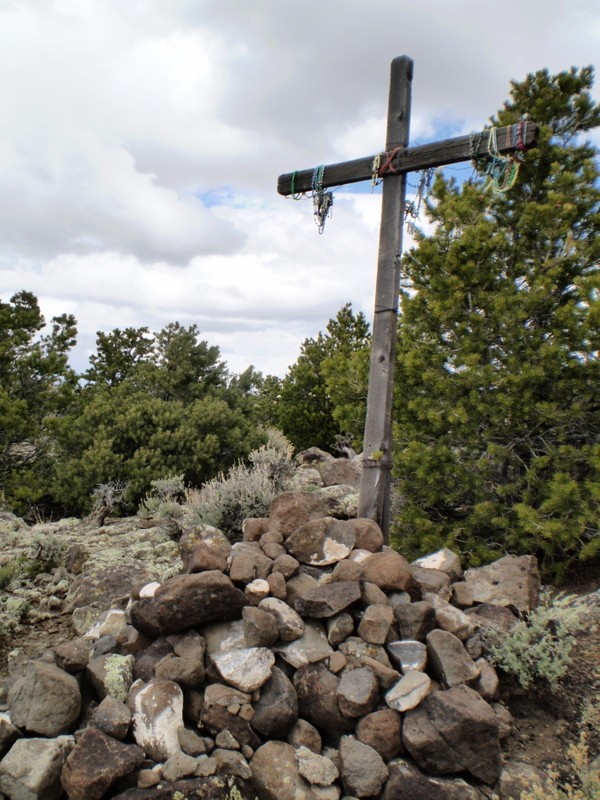 Then we headed up LaVeta Pass on the way to our next adventure. On April 25, 2015, LaVeta Pass basked in radiant sunshine, unlike an earlier adventure there. 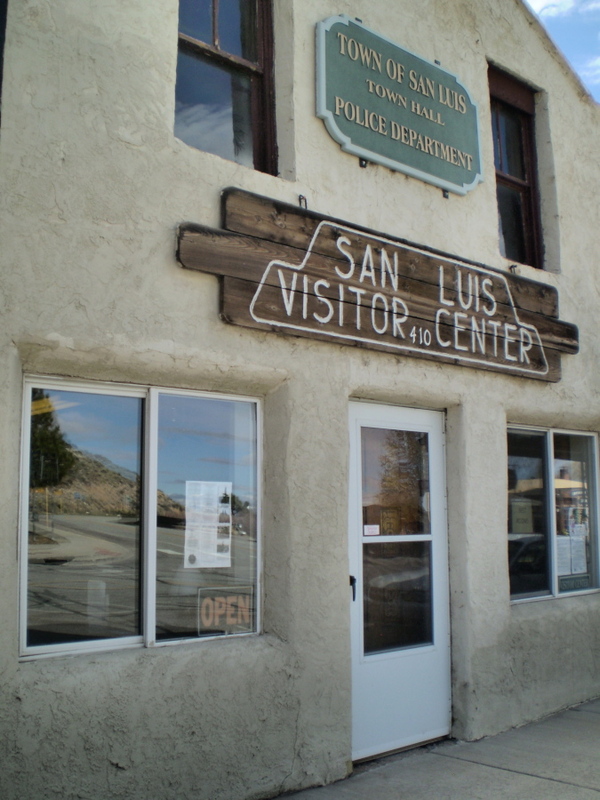 In December 2007, we had traveled to San Luis to attend a tax sale. 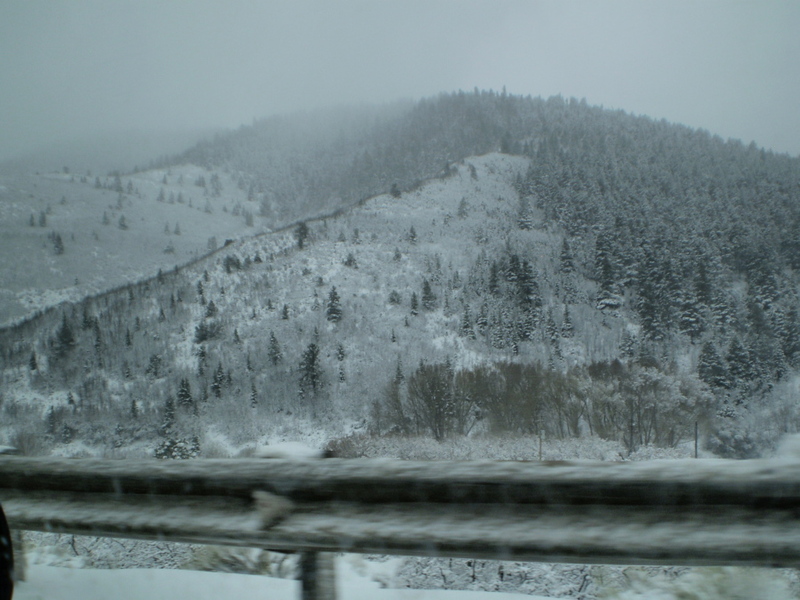 While the weather was perfect driving over the mountain that time, it was terrible coming home. 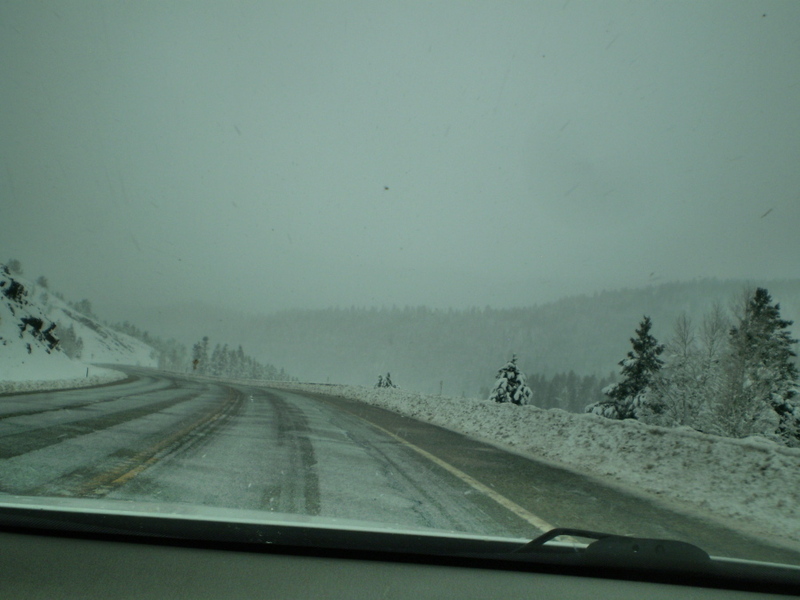 We encountered a heavy snow storm, and our car learned how to slide and skate over the pass. Saturday, April 25, 2015 was a different story. Hopefully, the entire trip will be like this, I thought. 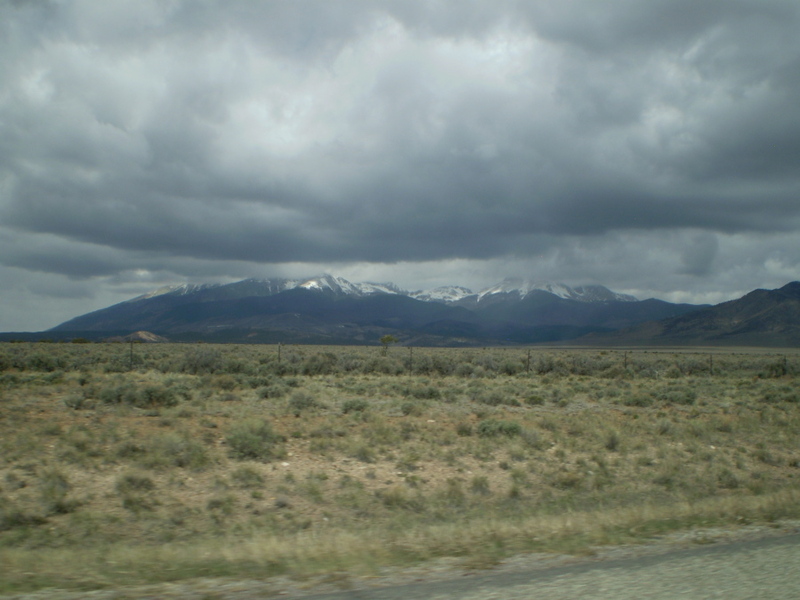 Once over the pass, we stopped at the base of Mount Blanca where we slowed down so I could take a picture. 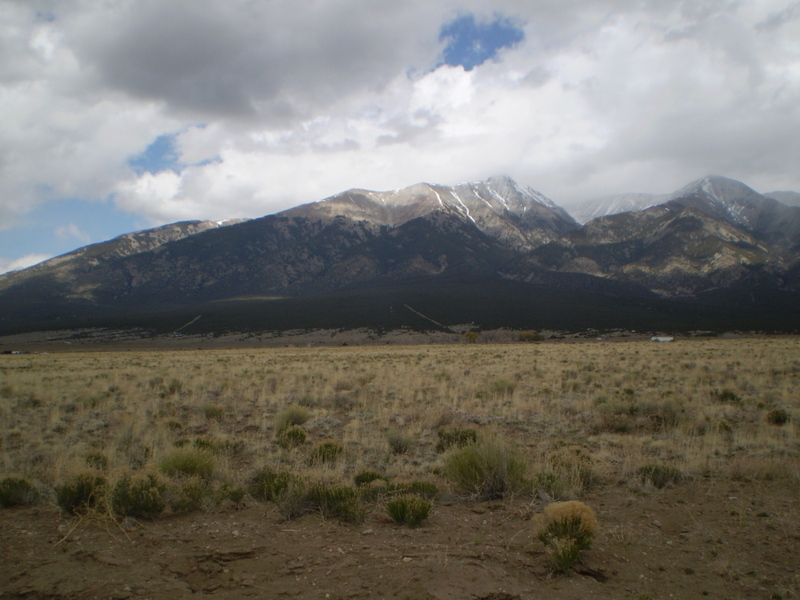 Mount Blanca–one of Colorado’s 14ers–14,345 feet! 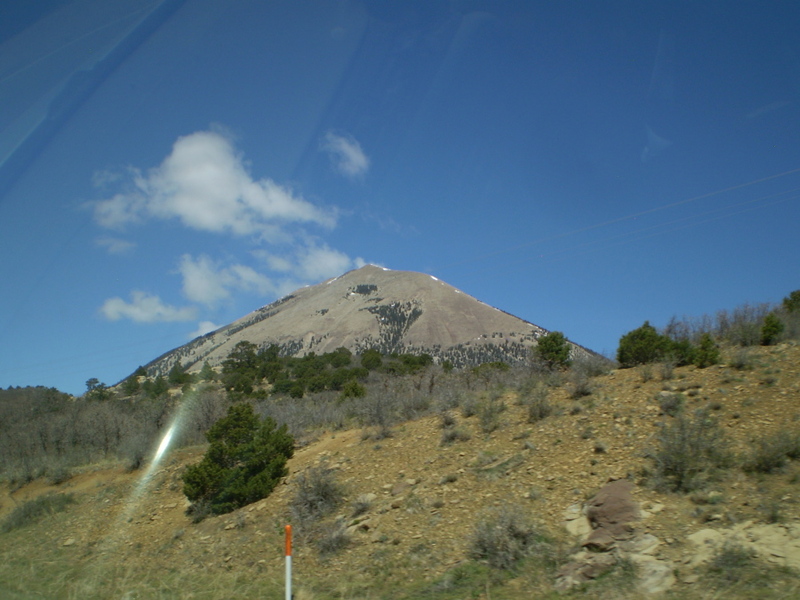 It is Colorado’s fourth highest mountain. I did notice the clouds forming over the mountain! 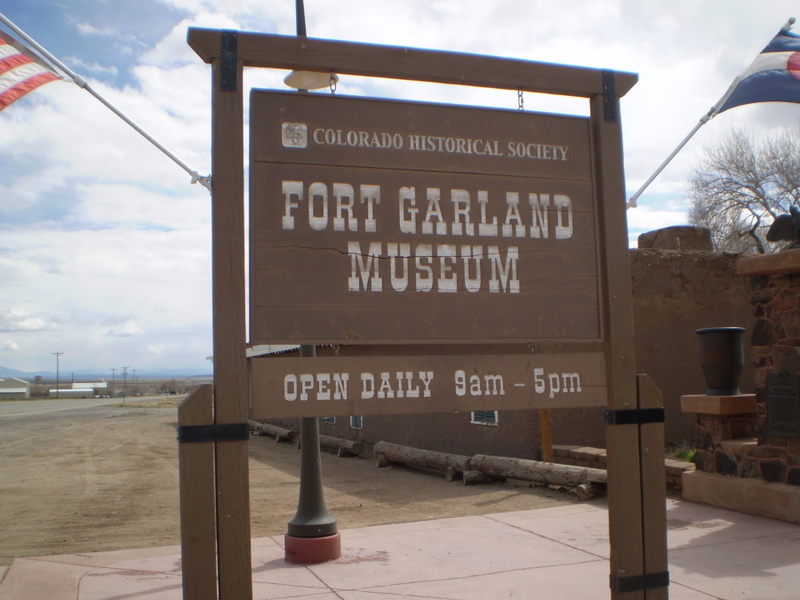 Fort Garland was our first stop on the other side of the mountain. 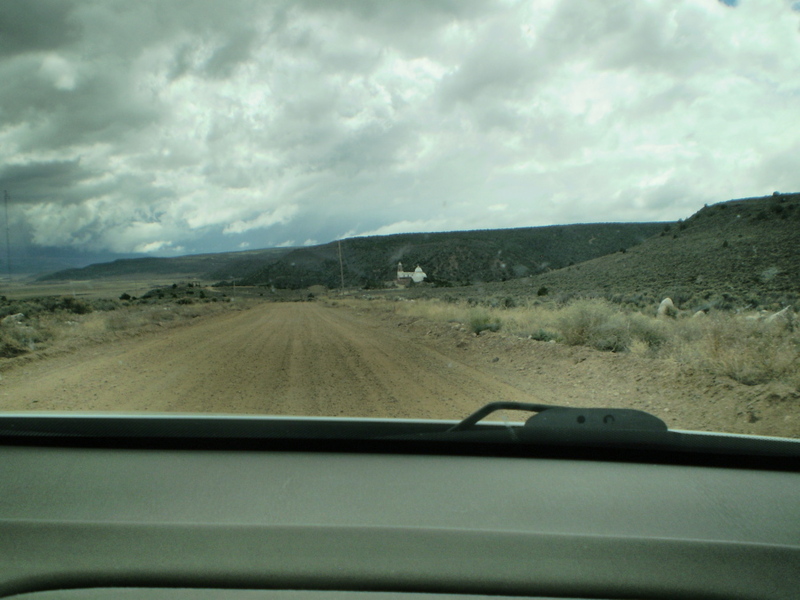 Howard planned to drive over to Blanca, so we would travel through Fort Garland to get there. That’s where we encountered a unique and interesting family. They were building a store and museum in the shape of an old fort. 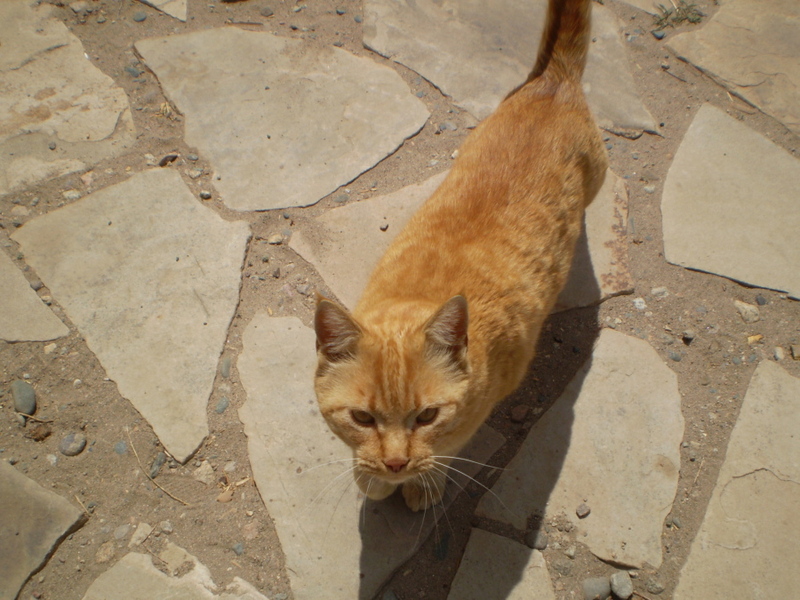 A welcoming committee stepped from the doorway to greet us! 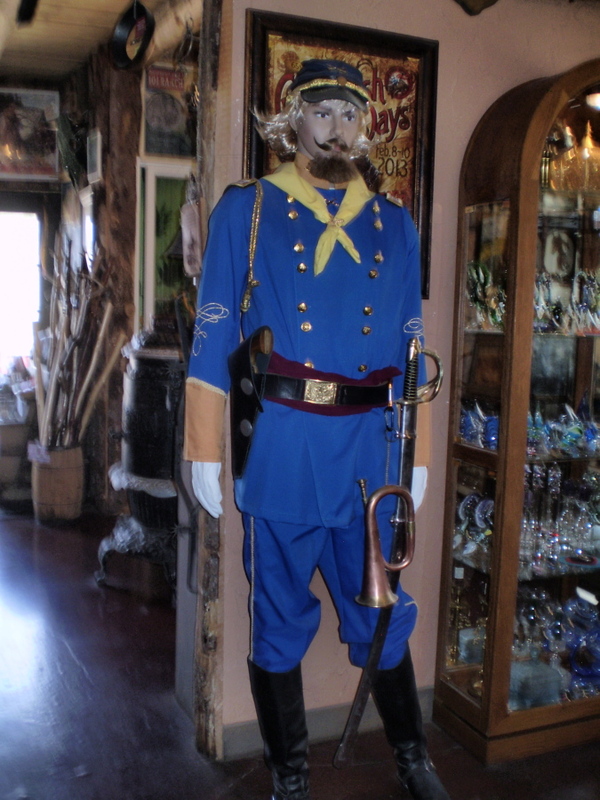 Welcoming Committee at the store, Fort Garland, Colorado. 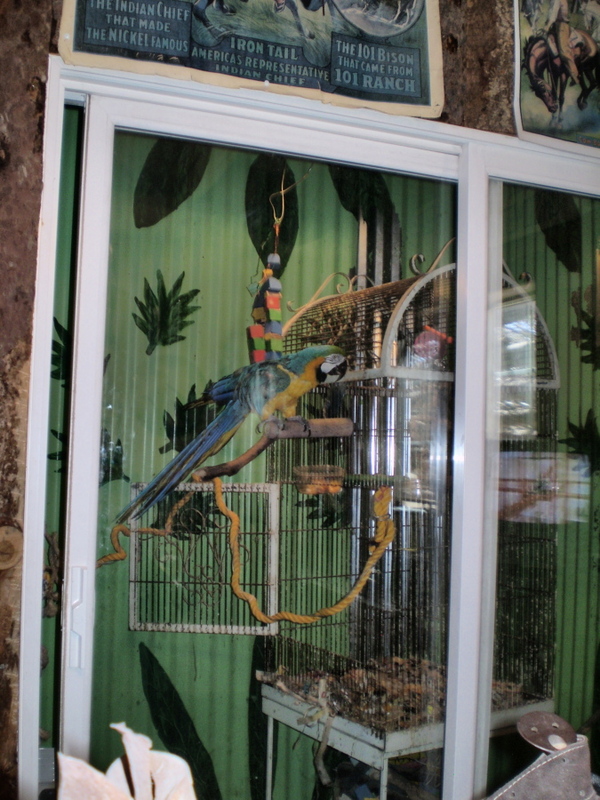 We even saw a parrot at the back of the store–a pet who was 20 years old! (The owner told us they live to be between 80 and 100 years!) The parrot was in a large cage and watched cartoons on television! The owner told us parrots have the mind of a human three-year old! Pet parrot on a perch watching cartoons on a television set! 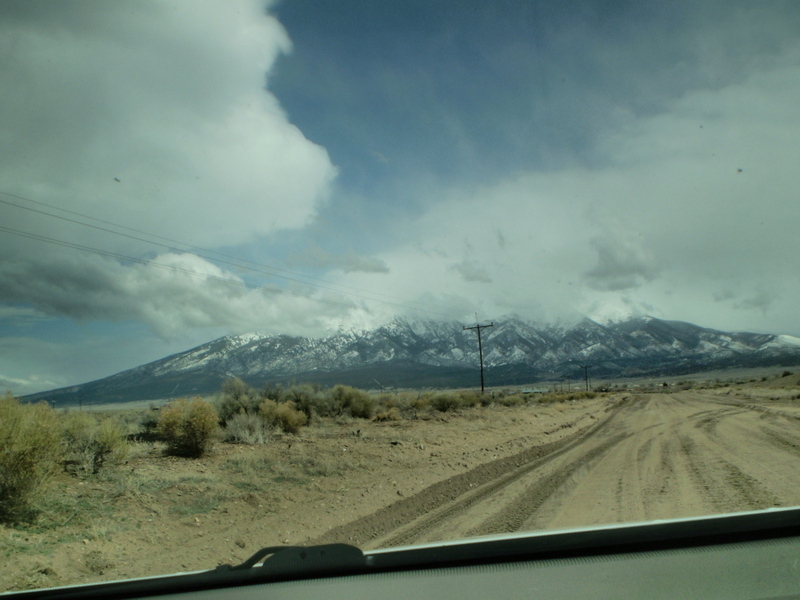 We left Fort Garland and headed toward Blanca–but not without stopping one more time to take a picture of the mountain. After the picture, we headed into Blanca for our anniversary feast: dinner at a small café–not as fancy as the place where we ate in Iowa City fifty-one years before, but it suited us just fine! Of course we had to check out the little fudge shop in Blanca afterward! 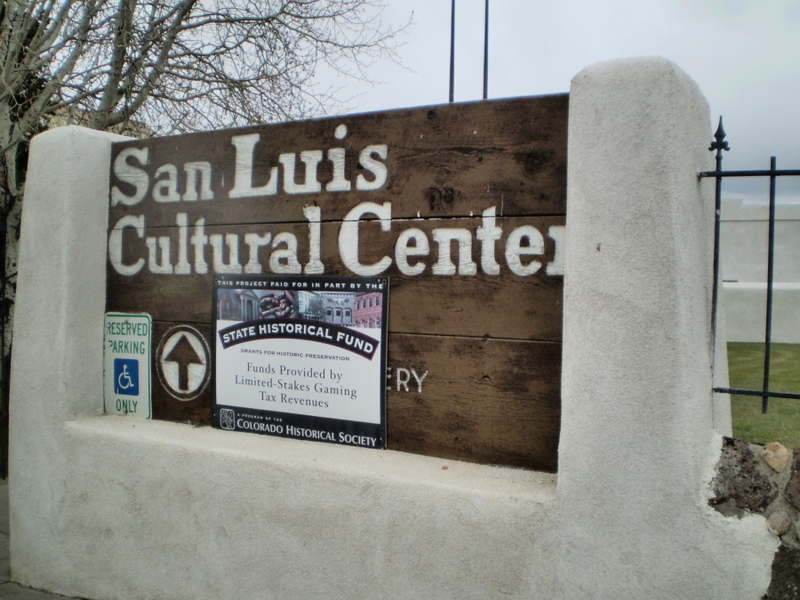 We probably spent about an hour at the Fort, and then we drove on to San Luis, where our Inn and more adventures awaited us. 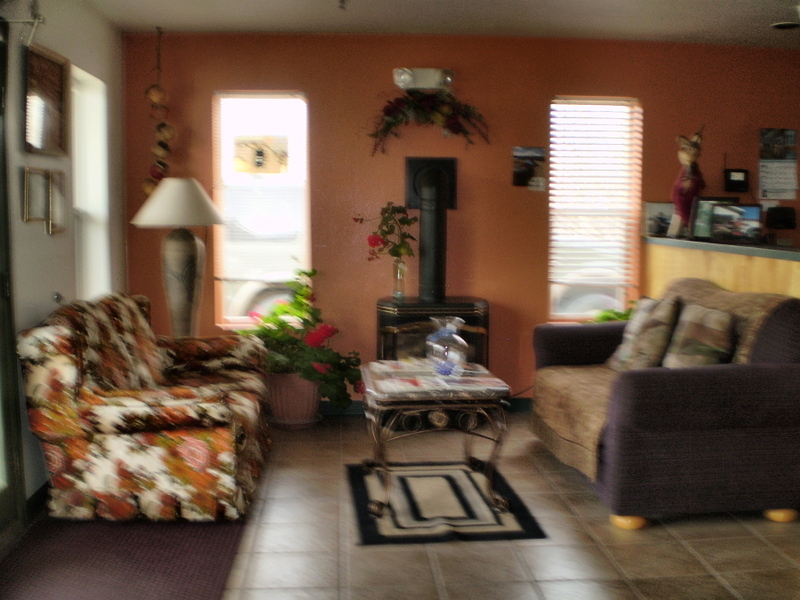 San Luis Inn Motel, San Luis, Colorado.